Posted by Angela Classen under Just Rambling! It doesn’t seem possible that 2017 is already gone. It was a strange year for me. Overall, I had more time to wander, explore and shoot, yet I took fewer photos than in years past. We moved in early October, so I guess packing/unpacking did occupy a big chunk of time and I couldn’t get away. I’m hoping 2018 will be more productive. These photos are ones that I like for whatever personal reasons, not because they are technically great or have perfect composition, etc. I just like them, and I hope you will too. 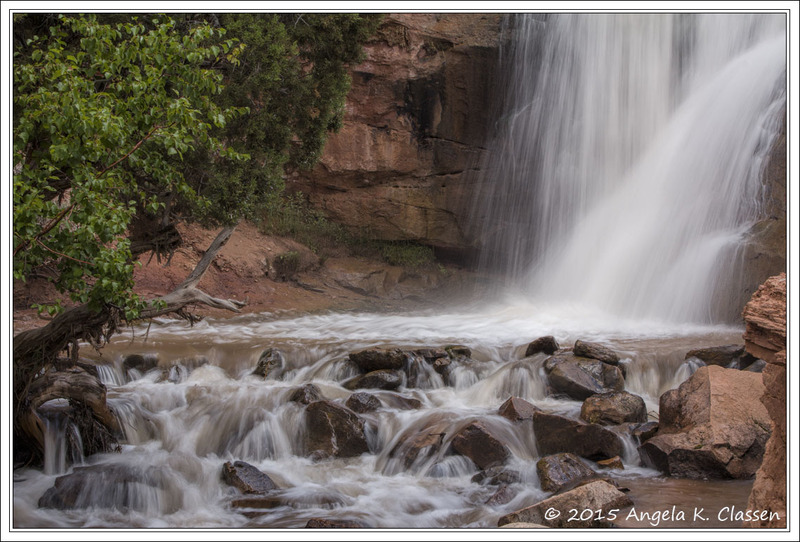 I spent quite a bit of time in the Pagosa Springs area this summer. During one weekend trip, my husband took me on a great tour of a mining ghost town, and we found some awesome wildflowers up on a 4WD road in the Wolf Creek Pass area. I like this image because the lighting and colors are soft and painterly. It makes me feel peaceful looking at it. My “happy place” is a wildflower filled mountain meadow with snow capped peaks in the distance and waterfalls lulling me to sleep. 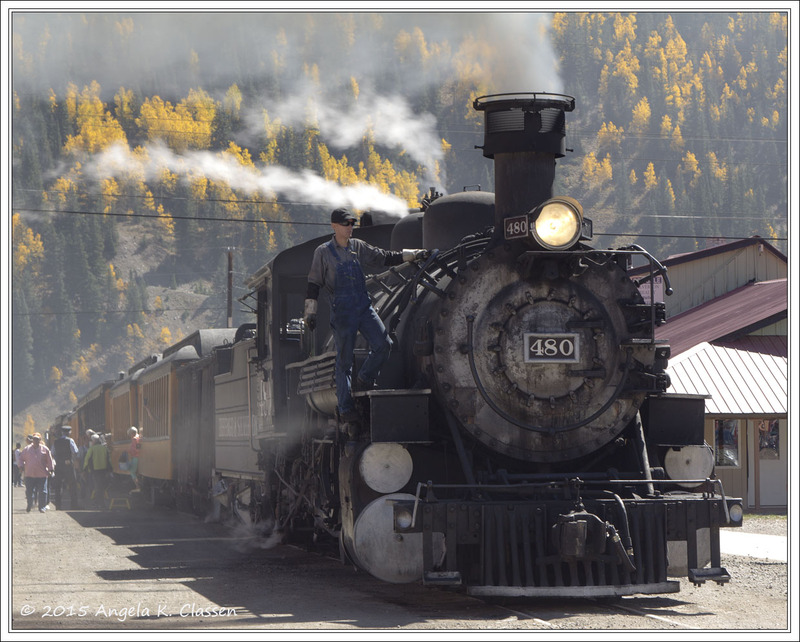 On my various trips to Pagosa, I usually went the Gunnison/Lake City route rather than the Red Mountain Pass/Durango route. I therefore stopped at this waterfall several times over the summer. This was the only time I was able to capture some nice cloud action. I love this waterfall! It’s roar is magnificent. I’m a Wichita native, and I’ve always loved the Keeper of the Plains statue created by Kiowa-Comanche artist Blackbear Bosin. It sits at the confluence of the Arkansas and Little Arkansas Rivers, right where the Mid-American All-Indian Center stands. A few years ago, they moved the statue and raised it, creating a much nicer display with some educational signage, and also built two very cool pedestrian bridges. In addition, they added “fire pots” around the perimeter of the statue which are lit at certain times. I visited Wichita over the Thanksgiving weekend, and since we were right there at Botanica (practically right across the road from the Indian Center), we went over to check it out at night. 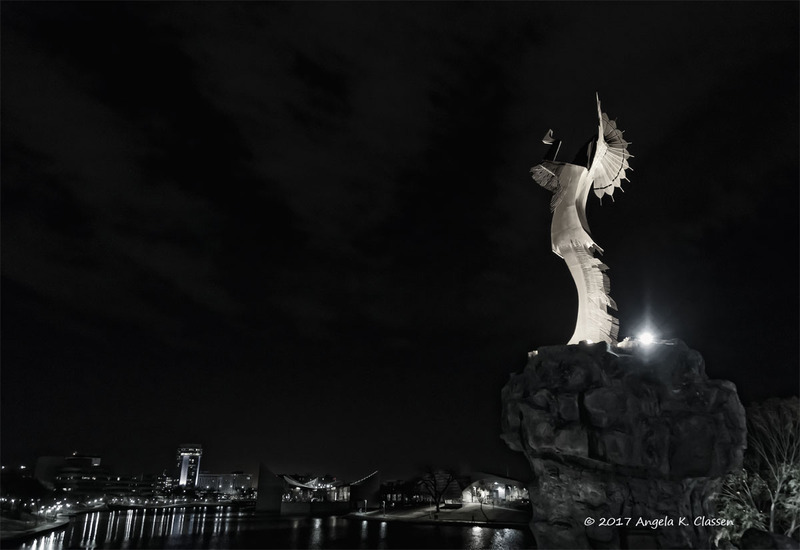 I captured both the statue and the skyline of Wichita in this image. Since there was little color anyway, I converted to black and white and really like the end result. 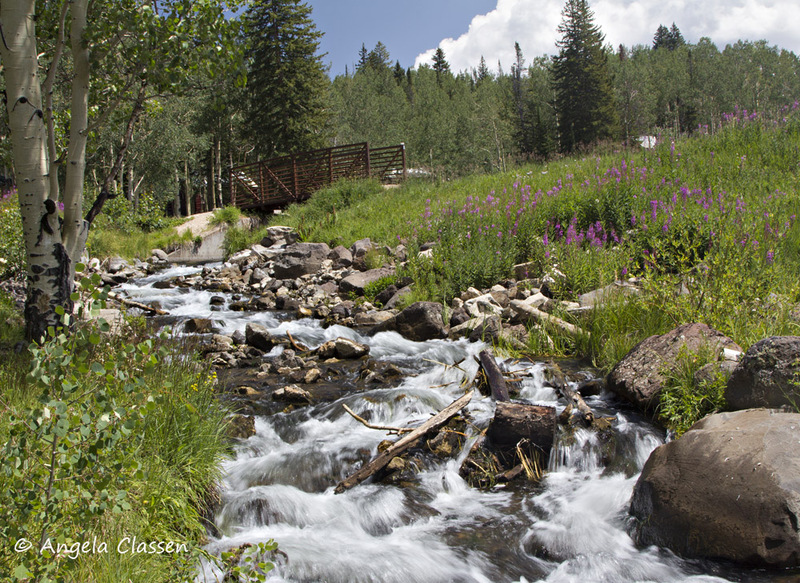 They refurbished and improved the overlook of Bear Creek Falls on Red Mountain Pass. This beautiful waterfall is just outside of Ouray on the sometimes scary Million Dollar Highway. Unless you stop at this overlook, you cannot see this waterfall as it plunges down into the gorge. Very limited compositions are available at this spot, and if you don’t have a wide angle lens, you likely won’t even be able to capture the entire waterfall. 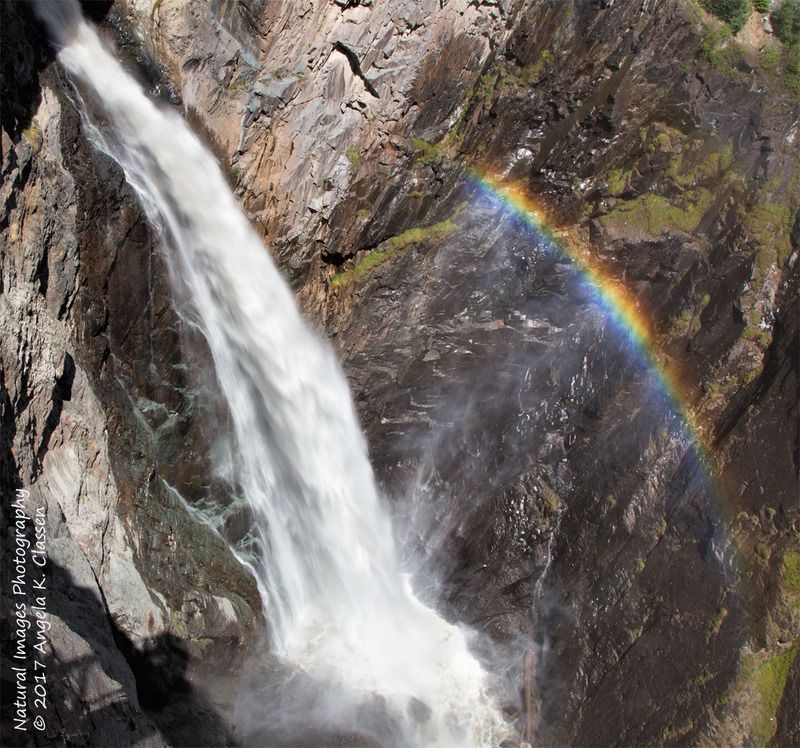 I happened to be lucky when I visited in June to catch a rainbow in the mist flying up from the falls. I’m scared of heights, so I had a little heartburn leaning over the edge trying to capture this! I cropped it square to place emphasis on the falls and the rainbow and to eliminate the rather uninteresting rocks surrounding it. We spent the weekend in Moab in March to celebrate our wedding anniversary. We hit the Gemini Bridges area at sunset to see what I could capture. I really like this image because of the clouds in the sky, the warm colors of the cliffs, and the light hitting the tree snag in the lower left corner as well as the Behind the Rocks area in the background. There are a lot of awesome trails in this area, along with great canyon views. Due to our move in early October, I unfortunately missed most of the peak fall color. 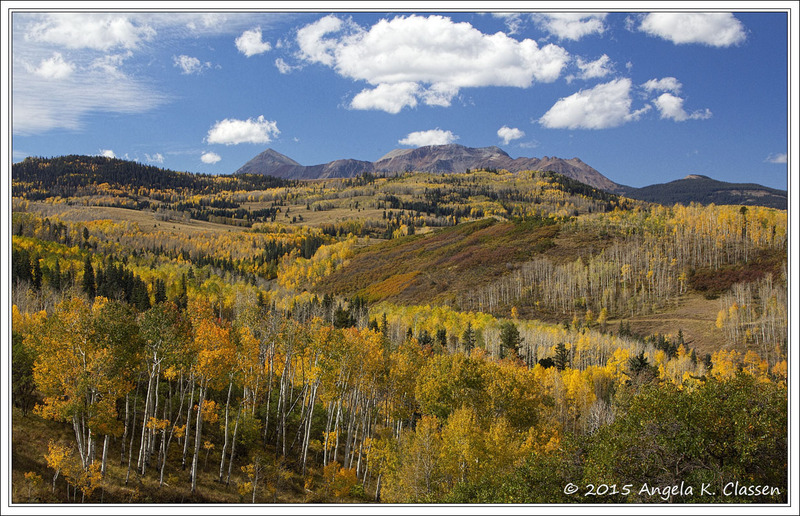 I did manage to get out the second weekend of October and there was a little bit of color still to be found up on Kebler Pass. 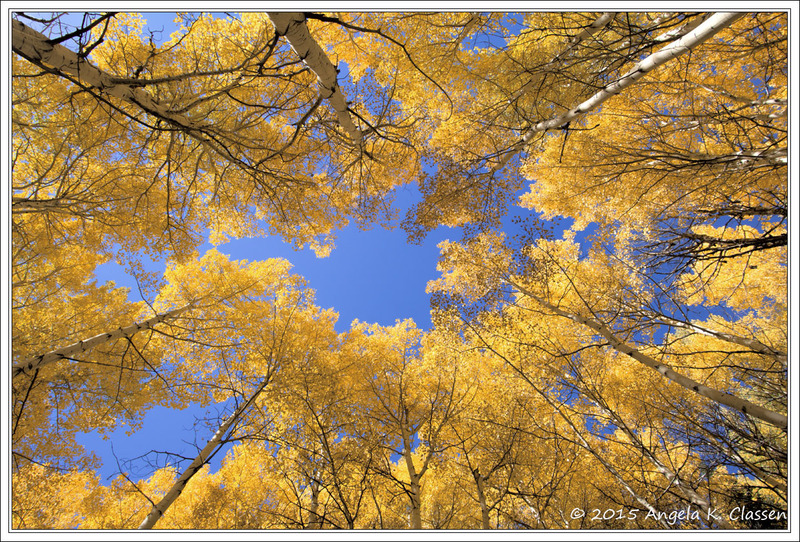 I framed this image with the bare aspens in the front and really like how it turned out. The bare trees did add a different element that I like. 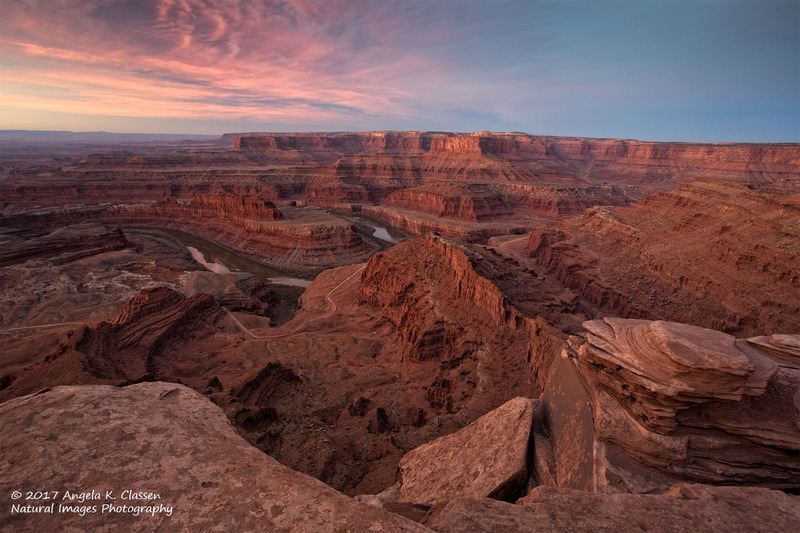 In early December, I decided to catch a sunrise at one of my favorite Moab locations: Dead Horse Point. I was lucky enough to capture a little bit of pre-dawn color and some clouds, bathing the canyon in warm light. After my sunrise shoot, I did a 7 mile hike on some of the awesome new trails at the park, had a picnic lunch, took a short nap, and explored while waiting for sunset. Sunset was a bust, but hey – you can’t have a great sunrise and sunset in one day, right? Hiking up to Blue Lakes near Ridgway has been on my bucket list for awhile, so this year I decided to go for it. I hiked solo, and carried a 17 lb. 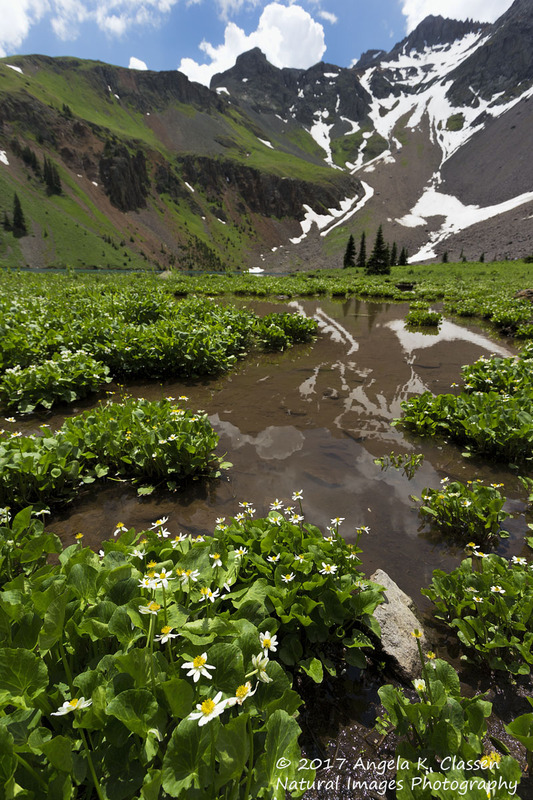 pack all the way to the first lake – a 7.6 round trip hike with 1600 feet elevation gain. Physically, this hike was quite a challenge for me, but I made it! The weather cooperated as well. It didn’t rain until after I got back to my car! After seeing it, I’ve decided I must go again. It is spectacular! There were still quite a few wildflowers blooming but had I gone a week or 10 days earlier, I probably would have seen more. This is the only vertical image that made it into my favorites for this year. I hiked up to this overlook numerous times this spring, trying to capture some good light. I finally hit it right one afternoon, and spent nearly an hour at the top, shooting different spots that I had scouted on previous trips, watching the light change as the clouds moved in and out. 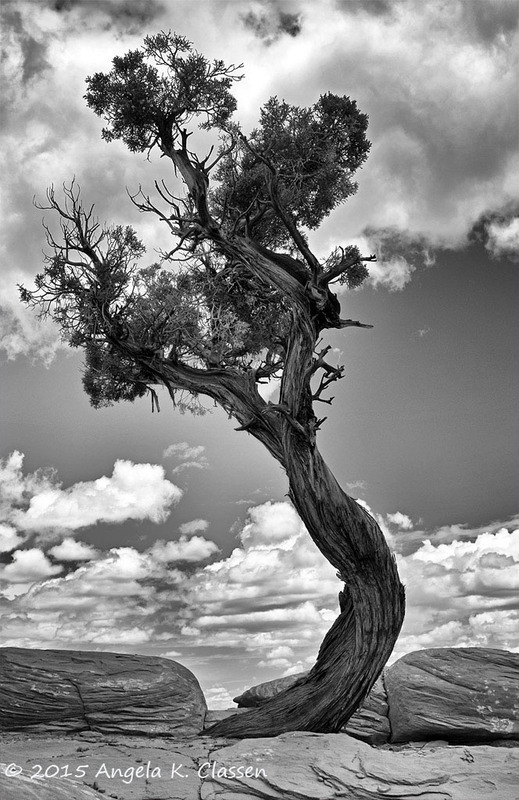 I also have a thing for solitary trees, and this great old dead juniper snag was the perfect addition to this image. I even printed this one up, and I was very pleased with how it turned out. Once I get a frame, it will hang either in my house or at my office. And now (drum roll, please…) – here’s my favorite image of 2017. In mid May, I had a free weekend and decided to head over to Goblin Valley in Utah. As I neared the turnoff on I-70, storm clouds were looming. I pressed on, despite the fact the wind was gusting and thunder was rumbling. Once I got to the park, I had to come back to my car to sit out two little squalls as they moved through, but the second one was late enough in the day that I caught this awesome rainbow over the Three Sisters formation, which is just north of the main valley floor. I felt really lucky to be able to capture this one. You can even see a faint second rainbow over on the left. Storm light really is the best! As for accomplishments in 2017, I really had none to speak of. 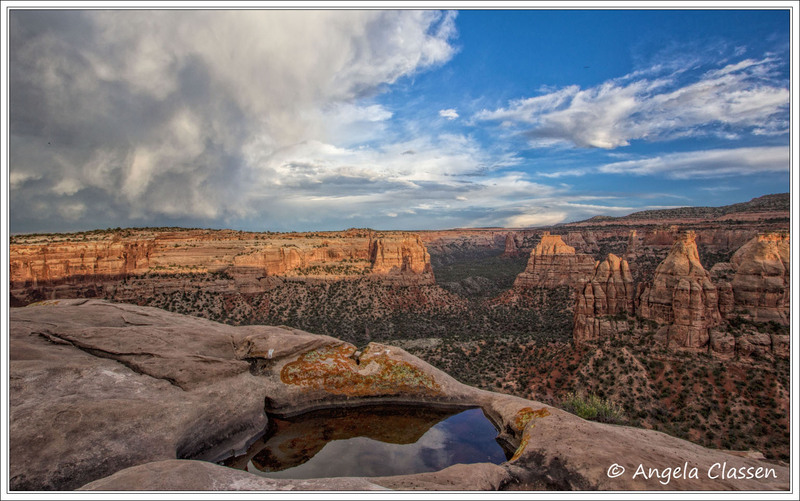 Brown Trout publishers will be using two of my images in calendars, and the Colorado National Monument used two of my images in its annual calendar (one was a large monthly shot) but that was about it. I had no shows or displays anywhere. I’m hoping 2018 will be a little more active photographically, and more quiet on the homefront. I wish you good light, great clouds and awesome photos in 2018! Thunder Mountain Camera Club had a “splash” class in July. Several members had stations with different techniques of shooting water and/or water drops set up for us try. One of them was a “drop” station, which was my favorite. 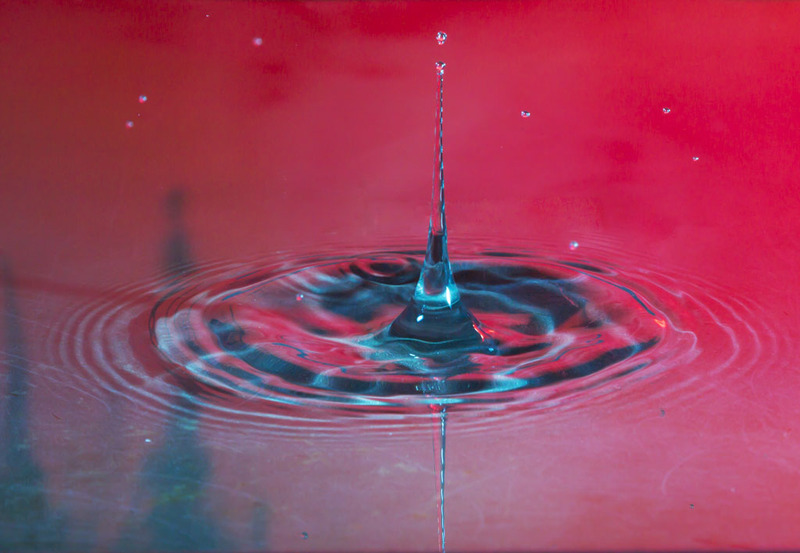 The water was dripping at a constant rate and different backgrounds were placed to change the light in the water pan. It was challenging to get the timing right, but I came away with a few really neat images, and this one was my favorite. I can’t remember how we got the water blue, but I love the contrast of it against the reddish background of the water. 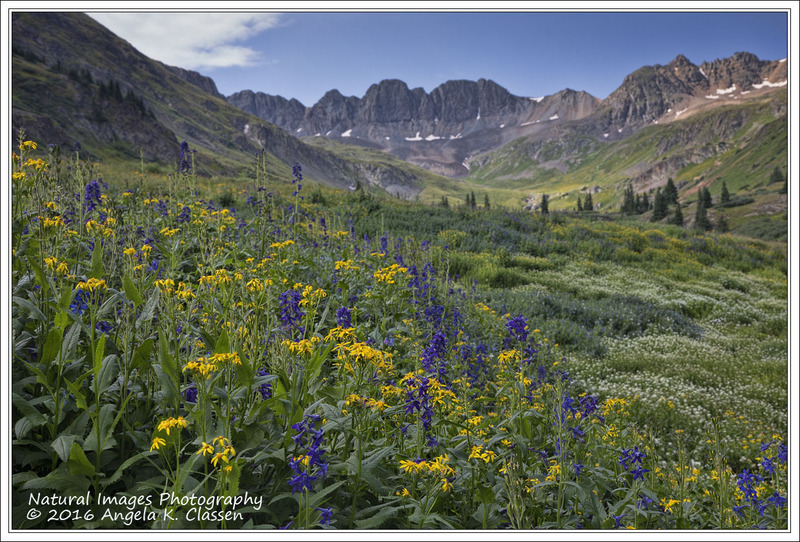 For quite some time, I’ve wanted to make the trek to American Basin (near Lake City) to check out the wildflowers. This year, I finally did it. Although the weather conditions weren’t the best and peak bloom had just happened, it was still an amazing place to see in person. This was one of the first shots I made that morning, near the stream that goes over the road. Even though peak bloom had happened about a week prior, there were still a lot of flowers and it was just amazing to see this beautiful place in person, finally. I plan to go back, if not this year, then the next. We’ll see how wildflower season shakes out this year. I’m keeping my fingers crossed! This year, I’ve played quite a bit with panorama shots. It’s so easy to create them in Photoshop, and the resulting image is more like what your eyes see, encompassing a much wider range of view. I went down to Red Mountain Pass the day after a light dusting of snow, and as I wound my way up, I found this viewpoint. It’s such a sweeping view, and the bright foliage and new snow was a great combination. It was the perfect view for a pano. 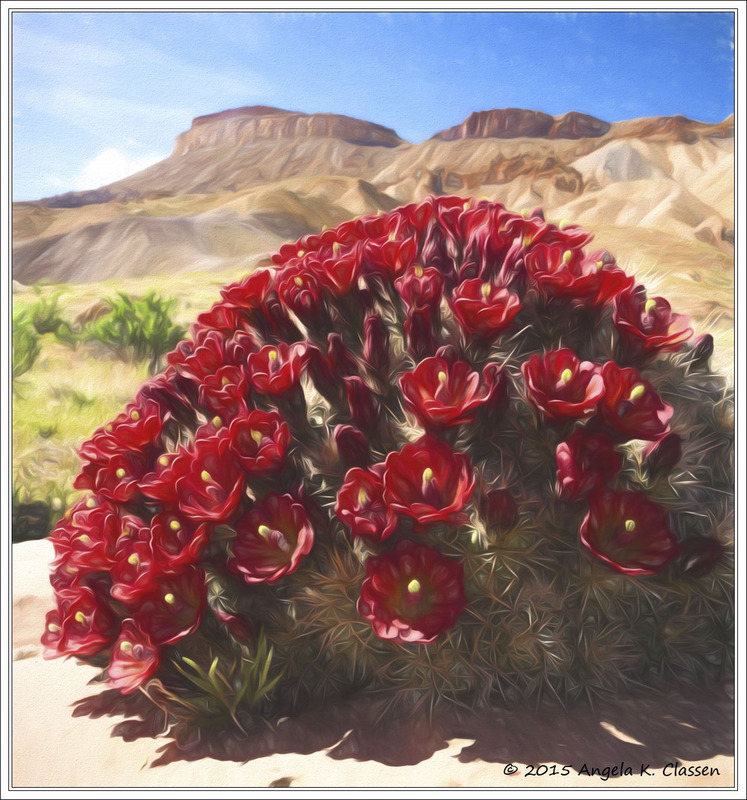 Every spring I anxiously wait for the claret cup cactus to bloom. Their bright scarlet blooms are absolutely gorgeous and seem so out of place in this dry terrain. Last year I learned of a huge claret cup near Mt. Garfield (several camera club members have shot this cactus so I have to give credit to them) and managed to capture it at or near peak this year! In post-processing, I applied a “Georgia O’Keefe” filter in Topaz Impressions and voila! This image made the top 10. 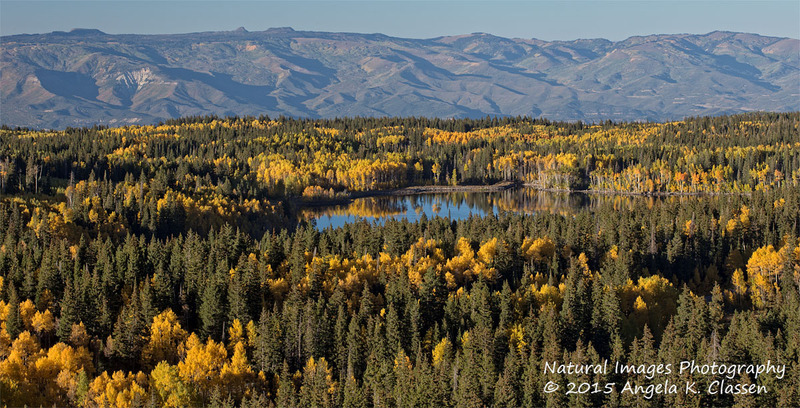 Fall begins a little earlier on the Grand Mesa than in the San Juans, which is perfect so I have time to hit them both! My husband graciously pulled off in what I call the “avalanche area,” which is above Mesa Lakes. It’s a tiny pulloff but big enough. There was no wind on this late afternoon, so I pulled out my 70-200 mm zoom lens and captured aspens reflecting in Griffith Lake with the Book Cliffs lined up behind. I think the compression caused by the big lens really makes this a neat shot as the Book Cliffs appear so much closer than they actually are. My husband took me up into the Book Cliffs one evening in May, and we had fun exploring and hiking a little bit of the Sarlac Trail. 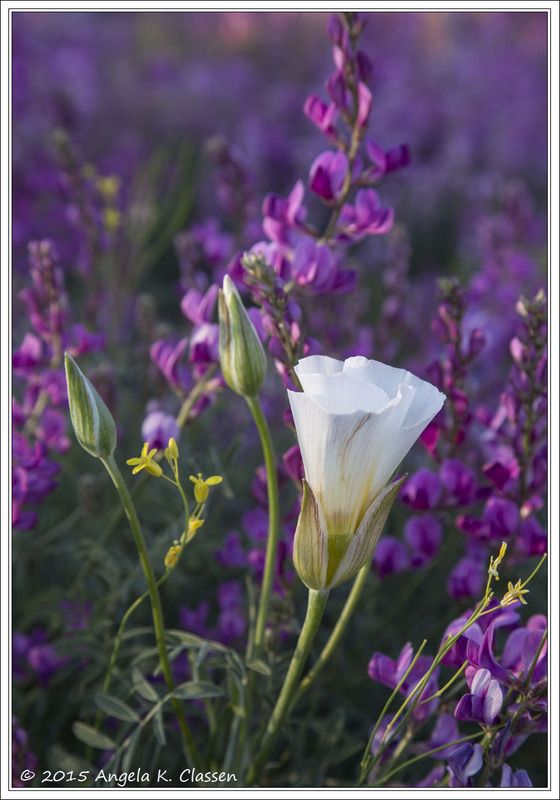 On that trail, I found this beautiful combination of a white sego lilly and purple chainpod. I love sego lillies but find them very hard to photograph. Because the sego was still mostly curled up and I shot it from the side and had some nice lighting, I was very happy with this image. 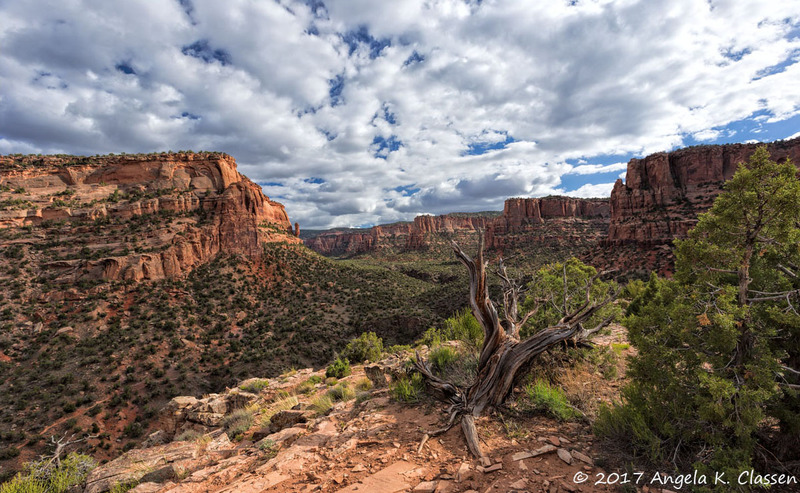 I spent quite a bit of time at Colorado National Monument this year, exploring new viewpoints and experiencing some really cool weather conditions, so it’s not a surprise images from the Monument are on the top of my list. I shot this one in August from the Grand View overlook area. I managed to capture the sun’s last rays on the rim of Independence Monument, as well as the rocks in the foreground, which contrasts nicely with the dark, stormy clouds. I was disappointed to find that the awesome juniper snag at this location (to the right of this image) has now disappeared – not sure if it was the victim of theft or if it simply was washed over the edge during a rainstorm. It was such a great foreground subject. 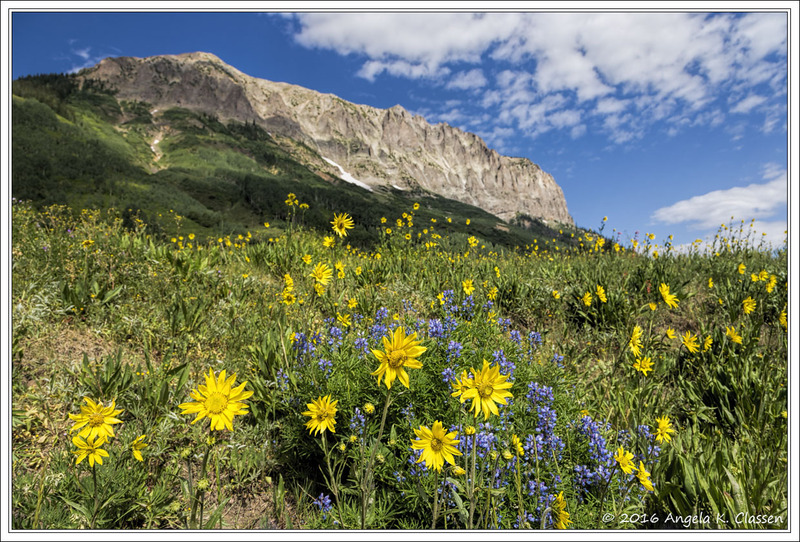 I went to Crested Butte in mid July to check out the wildflower bloom. Unfortunately, while trying to shoot some ferns up on Kebler Pass on the way there, I fell and twisted my knee, which really hampered my efforts that day. However, I did capture this image of nodding sunflowers on Gothic Road that made the trip worthwhile and the pain in my knee subside for a few minutes! Here is my second Monument image in the top 10. Again, pretty much the same perspective as #4 from Grand View, shot in late August. I got there in time to catch some very nice, warm light on the vegetation in the foreground, which I feel adds so much depth to this image. I also again captured nice rim light on the main monolith. And so, we are down to #1 – my favorite image of the year! I went to Black Canyon of the Gunnison National Park in late August for sunrise. Although sunrise didn’t quite pan out as I had hoped, in exploring the Dragon Point overlook, I found this amazing, twisted juniper tree. I was lying on the ground, using my wide angle lens to capture this. I wish the starburst in the top of the branches were a bit larger, but it was the best I could manage. I took this later in the morning on my second stop at this overlook, so the light was harsher and I decided to convert it to black & white. While I was at this viewpoint that day, I saw at least 15 other people take a photo of this tree. 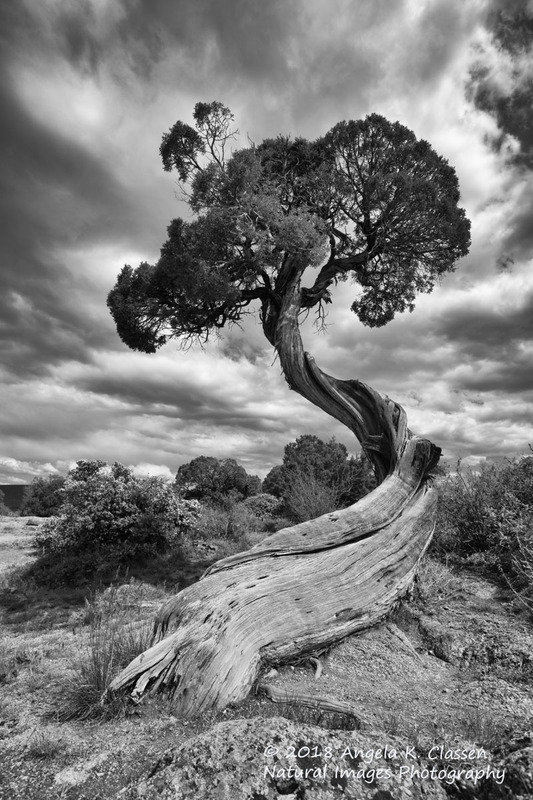 Guess I wasn’t the only one awed by its twisted, gnarled trunk! On the same evening as #5 was taken, while coming down from the top of the Book Cliffs, I saw this amazing layered view back into the valley. I made my husband pull over so I could take the shot before the light was gone. The lack of any vivid color naturally made it a candidate for conversion to black & white. 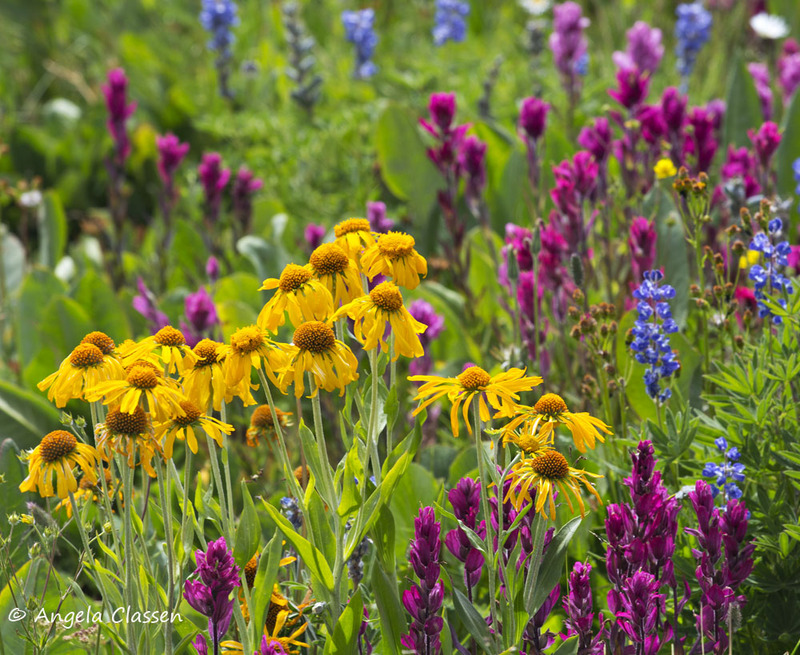 The spring bloom near the Rabbit Valley area was nothing short of incredible this spring. I made the trip out there several times and explored and found some great spots in the future for claret cup cactus photos. 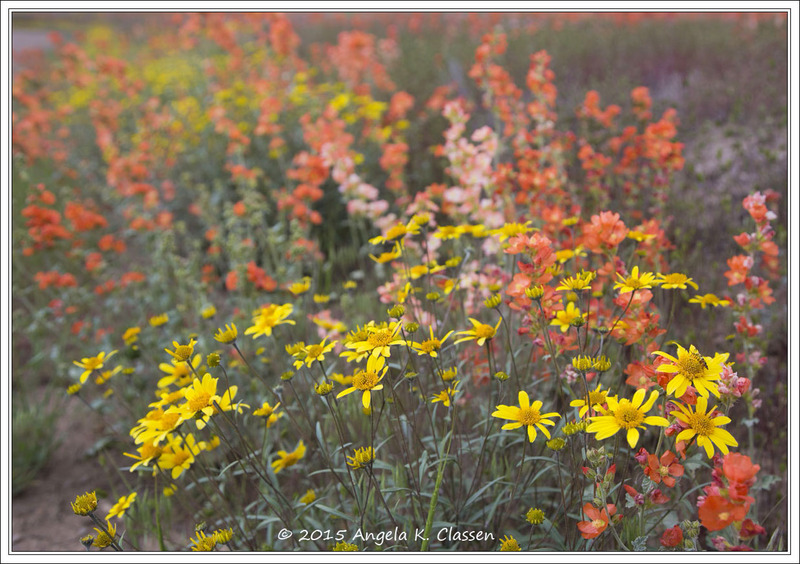 This image consists mostly of orange globe mallow, which were particularly profuse this year. It looked like an orange blanket in places – so beautiful and stunning to see in this normally arid place! We camped for a couple days near Pagosa Springs in May. Our campsite was surrounded by ponderosa pines. I captured this image of some arrowleaf balsalmroots framed by cinnamon colored ponderosas fairly early one of those mornings, while listening to an Abert’s squirrel chewing me out for being in his territory. 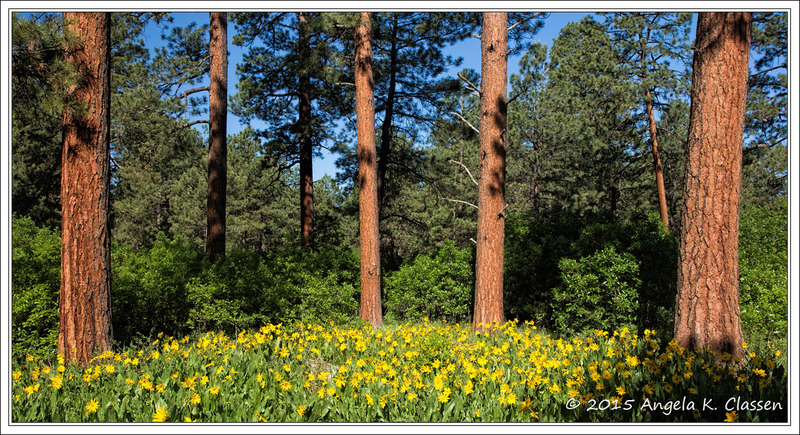 I really liked the color of the pines framing the wildflowers and greenery. I headed to the San Juans a day after a light snowfall (same day as #8), hoping for a fabulous sunrise at Dallas Divide. Well, as it happened so often in 2016, it didn’t happen. I’m still pretty happy with this image though, because the foliage colors were spectacular even in the muted light, and after sunrise some nice color bounced around on the peaks and in the clouds. I didn’t get out much to try my hand at shooting lightning this year, but on this night, I happened to be up at the Monument anyway when a storm rolled through the valley. 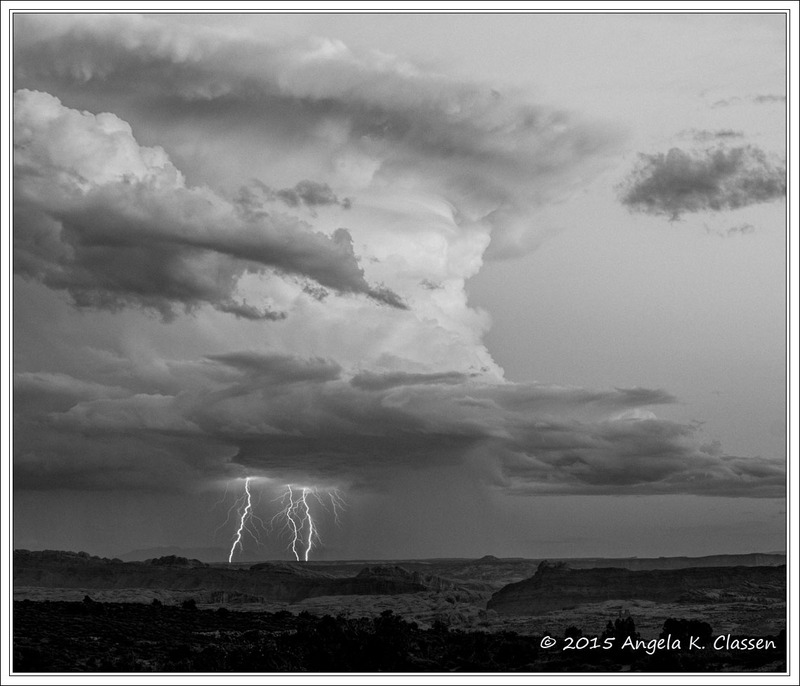 I managed to capture this one really cool bolt as it struck west of Fruita. 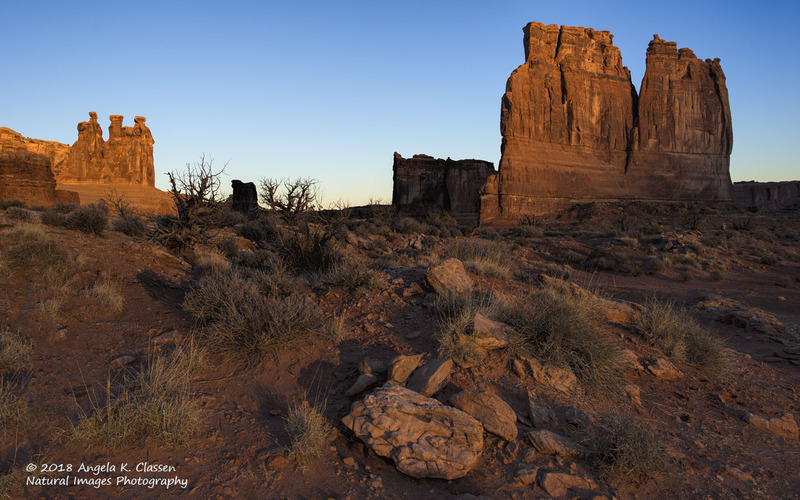 In early February, I headed to Arches National Park for sunrise only to discover it was totally socked in with fog. This was ok by me, so I had fun all morning shooting moody foggy scenes. After having lunch at Milt’s in town, the fog started to break up so I went back up. This image of Balanced Rock was shot shortly after the fog lifted. There’s still enough there to give it a little mood, but the sky was clearing out which contrasted nicely with the snow capped red rocks. I also like the little stump I caught in the foreground. So there you have my personal favorite images of 2016. This year was better for me on the personal front (I started a new job, again), so I traveled more, hiked more, and shot many more photos than in 2015. In 2016, I made trips to Goblin Valley, Arches/Canyonlands (numerous times), Black Canyon, Crested Butte, Telluride, Steamboat Springs, the San Rafael Swell, Pagosa Springs, American Basin, and the Grand Mesa (multiple times). I hope to travel (and shoot) a lot in 2017. I was really lazy on the education end and spent no time learning any new processing techniques. I just renewed my KelbyOne membership so I plan to do something about that in 2017. I really need to learn layers and masks in Photoshop as I feel they would take my photos to another level. I wish you the best in 2017 – happy image hunting, and may you be blessed with just the right amount of clouds and fantastic light! Feel free to leave any comments about my images, or ones you think should have been included. 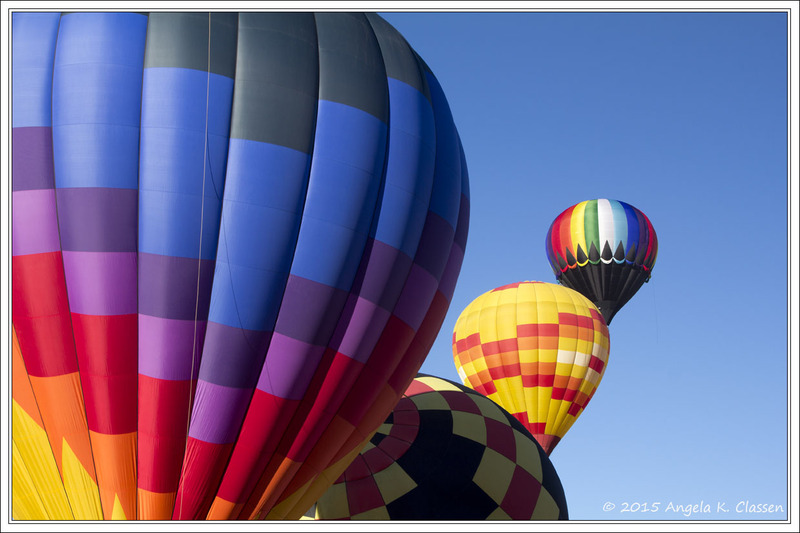 I was asked to be part of the City of Grand Junction’s Hot Air Balloon art display at Two Rivers Convention Center. I have the six below images on display in the hallways of Two Rivers. 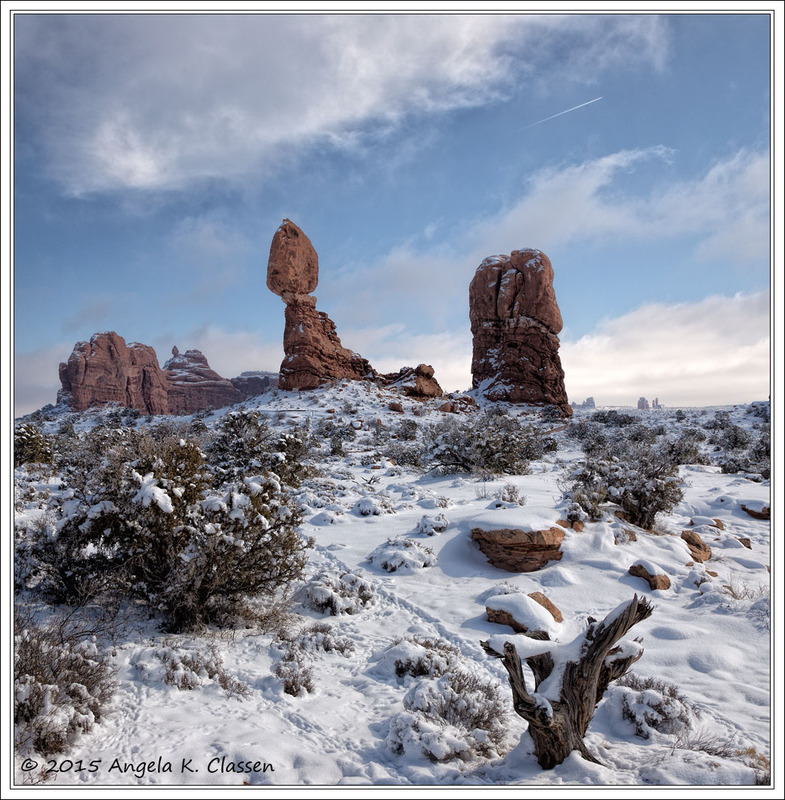 Three are smaller traditional matted, framed photos; three are printed on 20X30 canvas. They will be up until sometime in mid June. If you’re in downtown Grand Junction, please be sure to stop in and check them out along with the other amazing artwork. All of the artwork is available for purchase if you are so inclined. If I can get over there in the next week, I’ll try to post a follow up showing the images actually on the wall. Thanks for your support of local artists in the Grand Valley! 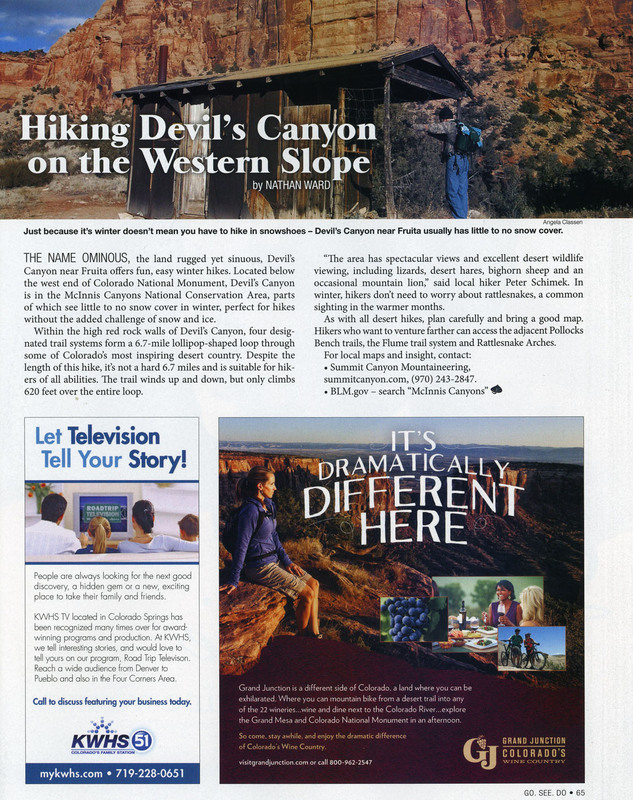 Colorado Life Magazine published one of my images in its January/February 2016 issue in the “Go – See – Do” section. 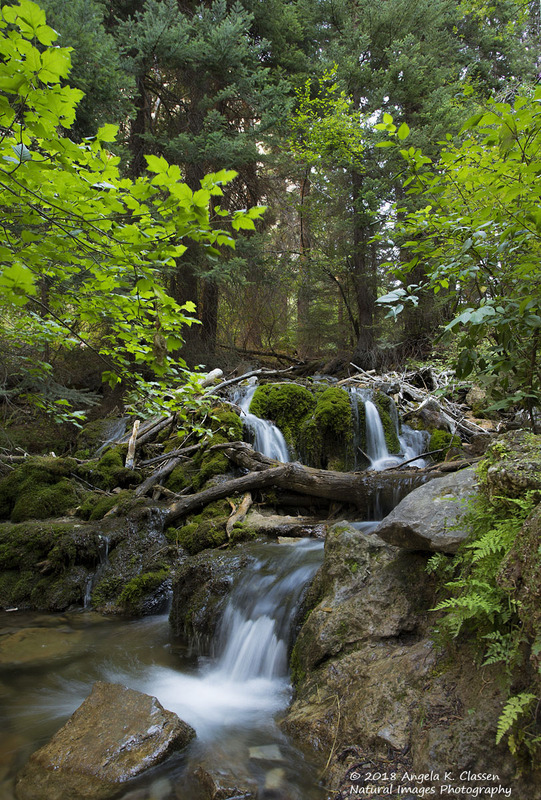 The image is one I took while hiking Devil’s Canyon, a local trail in the McInnis Canyons National Conservation area. My husband Mike is the model, and he is seen looking into the little cowboy shack that is located near the far end of the loop of the trail. It was early December so he is clearly bundled up. I assume they chose the image due to that fact – the article suggests hiking this trail in winter due to its lack of snow cover. This is the second image I’ve had published in this magazine and am pretty excited about it. The magazine always has interesting historical articles, fascinating feature articles about all things Colorado, and gorgeous photography. I’m proud to be a part of it! 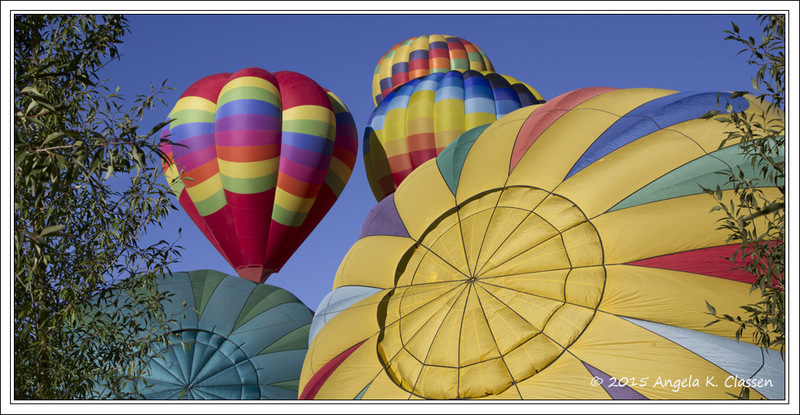 #15 – Up, Up & Away! 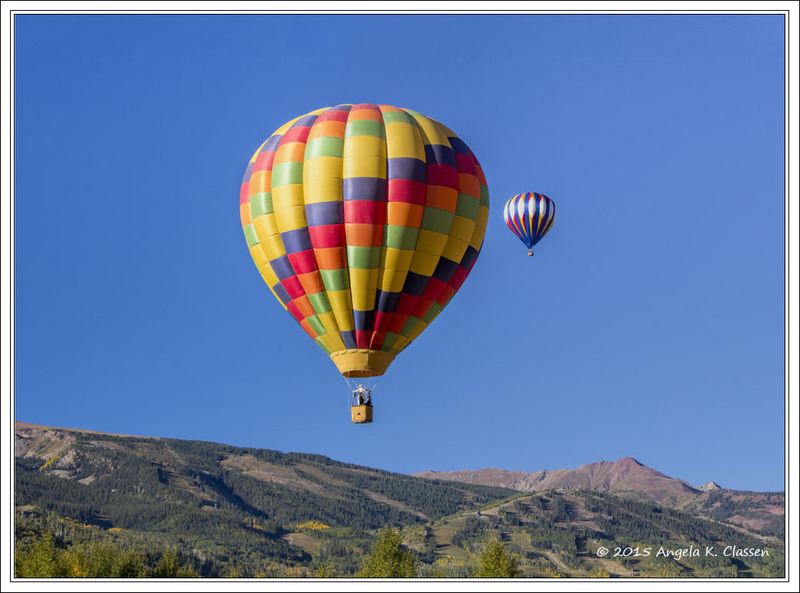 I had so much fun last year at the Snowmass Hot Air Balloon Festival I definitely wanted to go again, and ended up hitching a ride with my buddy Jeff Stoddart. After some “adventures” finding a place to shoot, we wandered around the field where they took off and I got this inventive composition as several balloons took off. 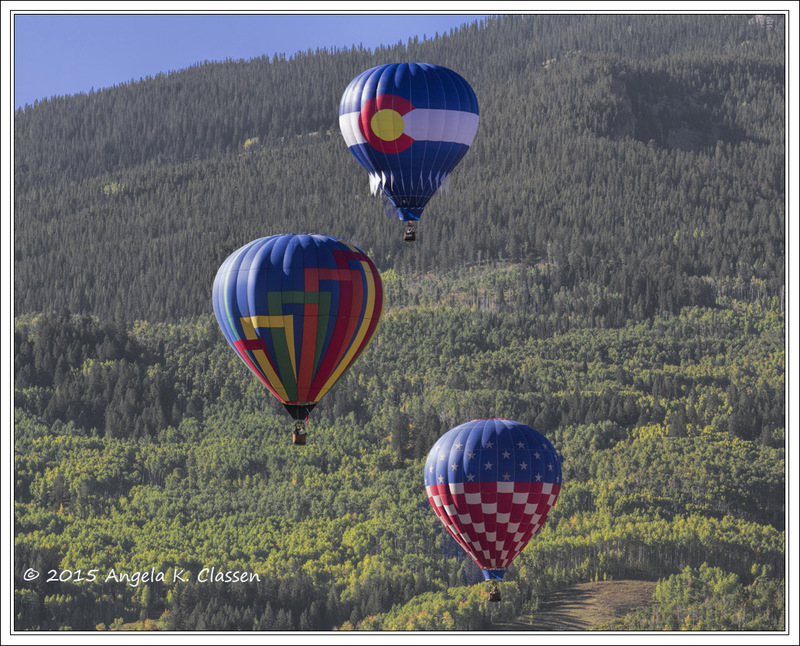 You can’t beat the colorful balloons rising in a blue sky with gorgeous mountains as a backdrop! I’ll definitely go again. 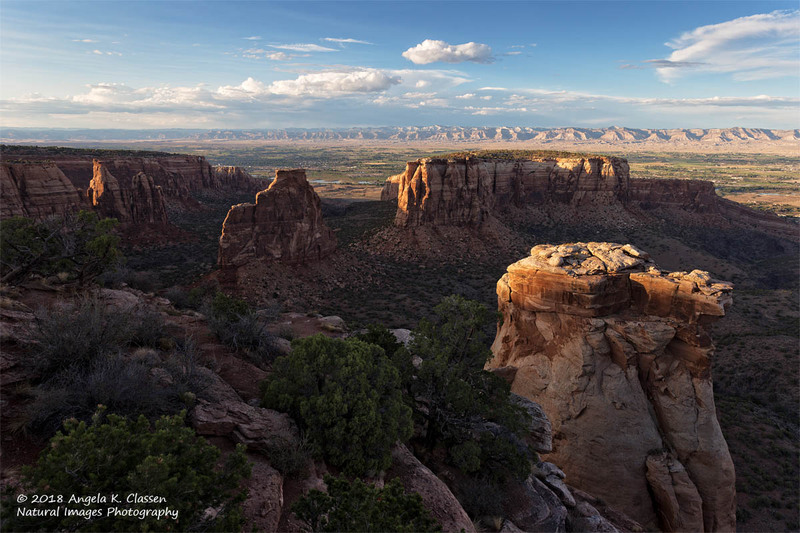 As most of my followers know, my favorite spot in the Colorado National Monument is up on the rim of Wedding Canyon near the Bookcliff viewpoint. I absolutely love the view of the monoliths and the numerous potholes that are found there. 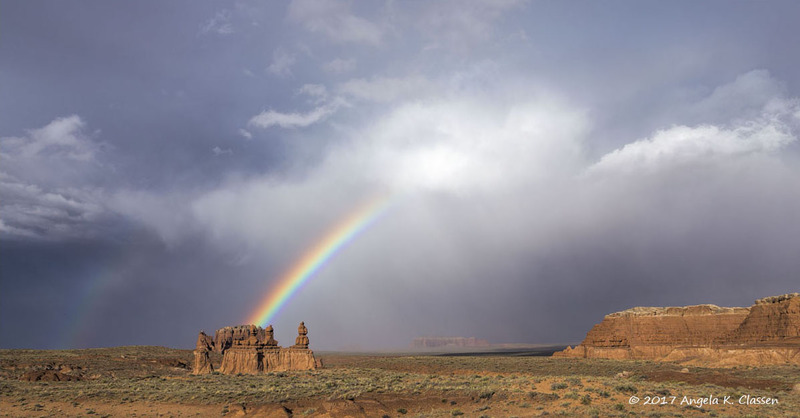 I took this image in late April as a spring storm raged over toward the Palisade area, while the sun shone in the Monument. 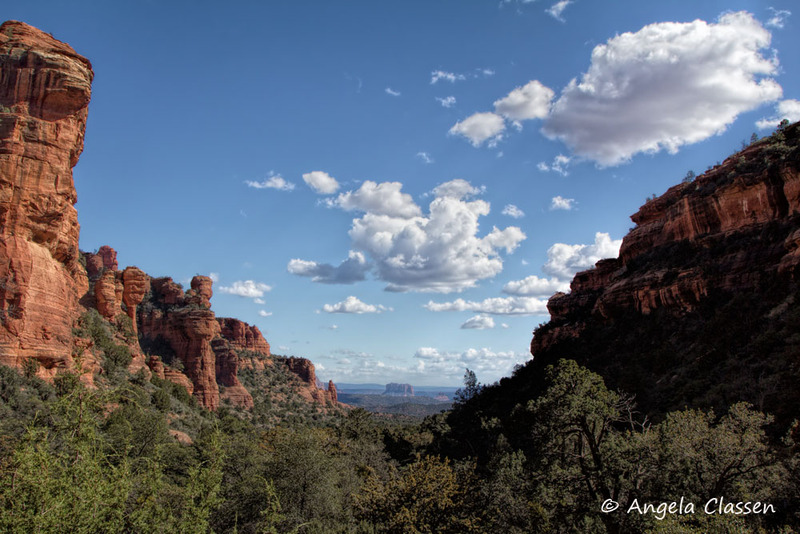 In March, we went to Sedona, Arizona. What a beautiful place on Planet Earth! The red rocks are absolutely amazing. We did a short 2.2 mile hike into Fay Canyon, which basically ends in a box canyon. When we reached the end, my ever-adventurous hubby climbed on higher and yelled “You’ve GOT to come up here and see this view!” Me, being not-so-adventurous, decided to follow him anyway and I was glad I did. From that vantage point, you could see out of the canyon and beyond into the valley. What a view! It was a beautiful, fun, easy little hike, one I would not hesitate to do again in a heartbeat. 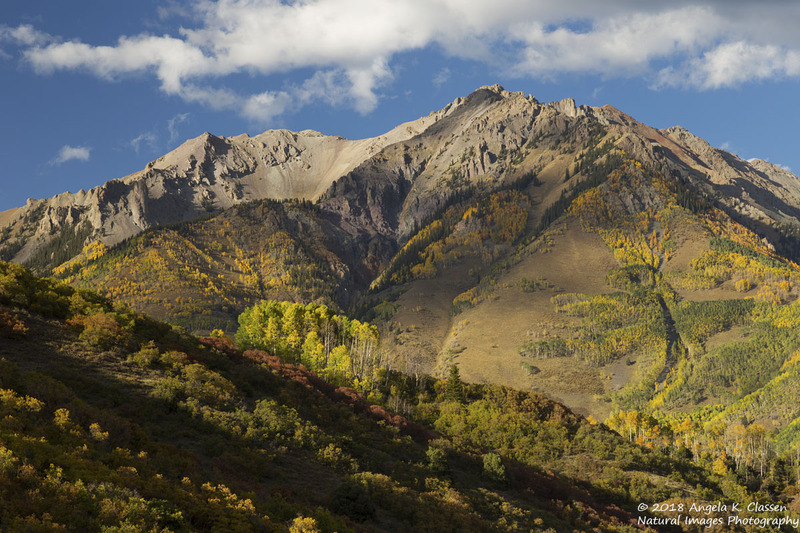 In October, we spent several days in the Ouray/Telluride area, one of the most spectacular places in the state of Colorado. Fall this year was a bit muted compared to prior years, due to abundant moisture which caused some type of fungus or blight on many aspen trees (and as I later discovered, in the cottonwoods in lower elevations). I did capture one decent sunset shot from the parking lot pullout looking onto the Dallas Divide west of Ridgway. It was a popular spot – probably at least 50 other photographers were there right next to me. Fall Creek Road near Telluride goes to Woods Lake, which was lovely but very windy. This shot was taken near the switchback going up to the lake. The Grand Mesa is sort of hit or miss with wildflowers. 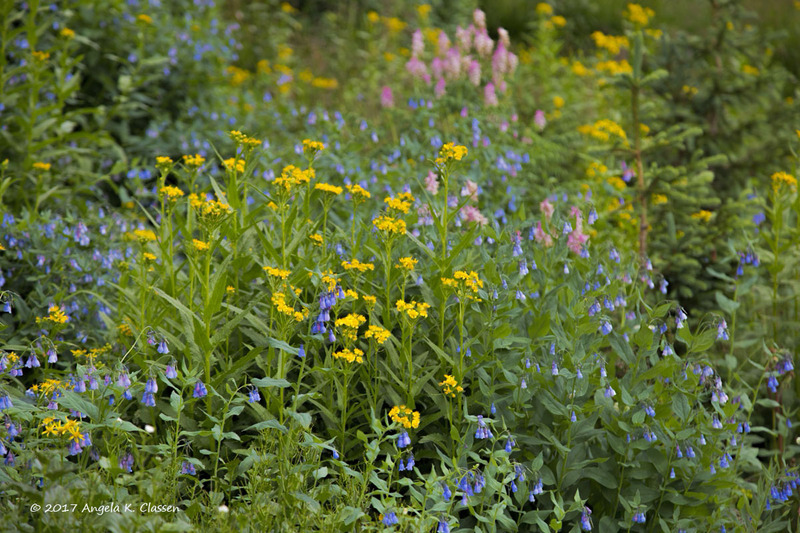 Some years the wildflowers go nuts; sometimes not so much. The yellow flowers in the front are sneezeweed and are definitely the most prolific flower to be found up there. I used a Topaz creative filter on this one to give it a special glow and feel that I like much better than the straight-out-of-the-camera image. 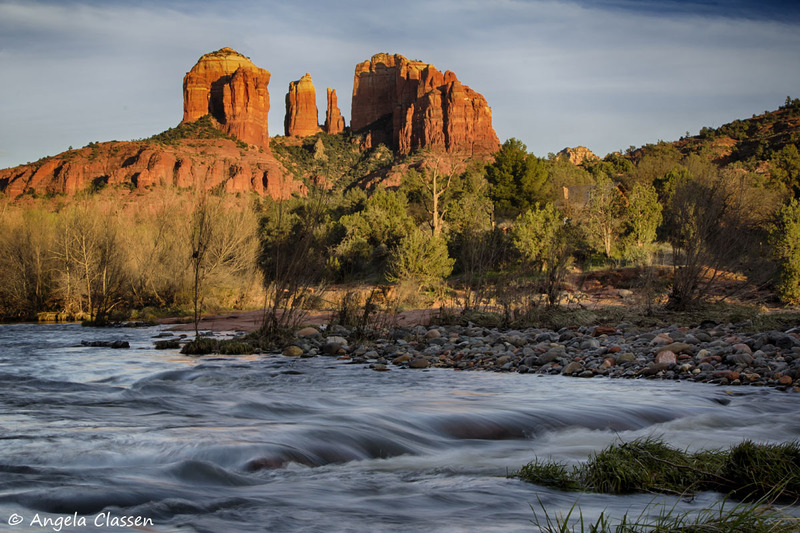 Cathedral Rock is likely the most photographed formation in the Sedona area, and with good reason. It is absolutely stunning, especially at sunset! I had done a fair amount of research and knew a spot I wanted to photograph from, where the rock would reflect in the river with a ledge of rocks in the foreground. Unfortunately, I hadn’t counted on the fact that it was spring runoff down there (it was March!) and the view I had in my head was covered up with extra water! But, I made the best of it. 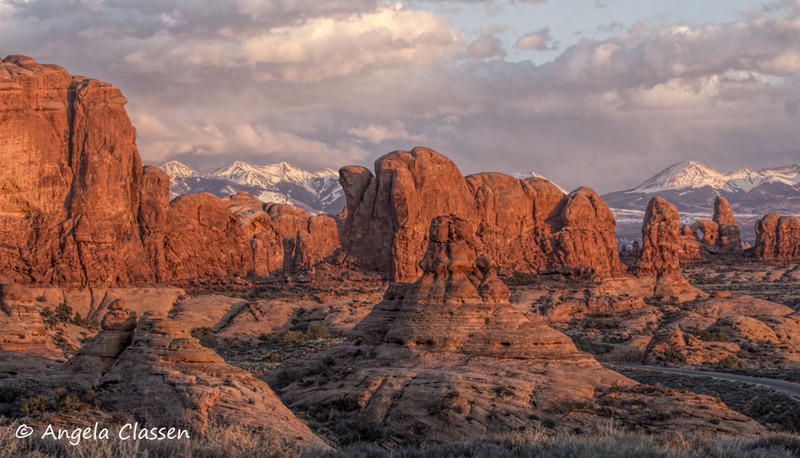 Arches National Park is one of my favorite places to shoot, and I’m always looking for something different and unique. 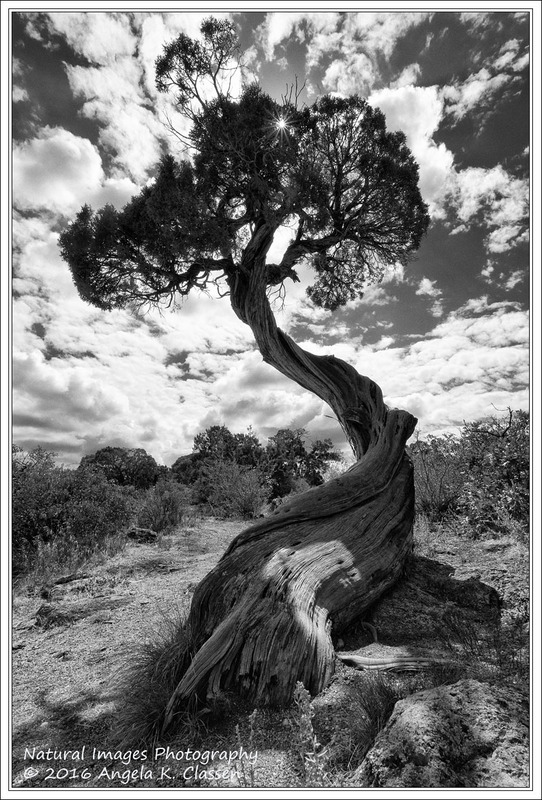 This spring, I found a very cool, twisted juniper tree near the campground and took a few shots. After deciding I didn’t like the light, I converted to black and white and loved the result. Lone trees are often a favorite subject of mine and this one turned out great. It netted me a 2nd place finish in my camera club’s black and white competition as well. I played more with black and white this year, as you’ll see later. 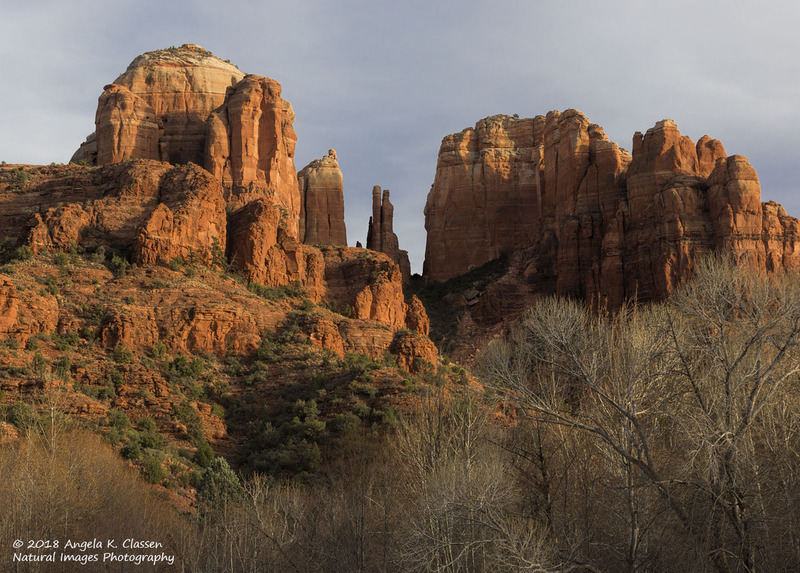 And back to Arches with this one – one of my favorite viewpoints in the park, the Garden of Eden. 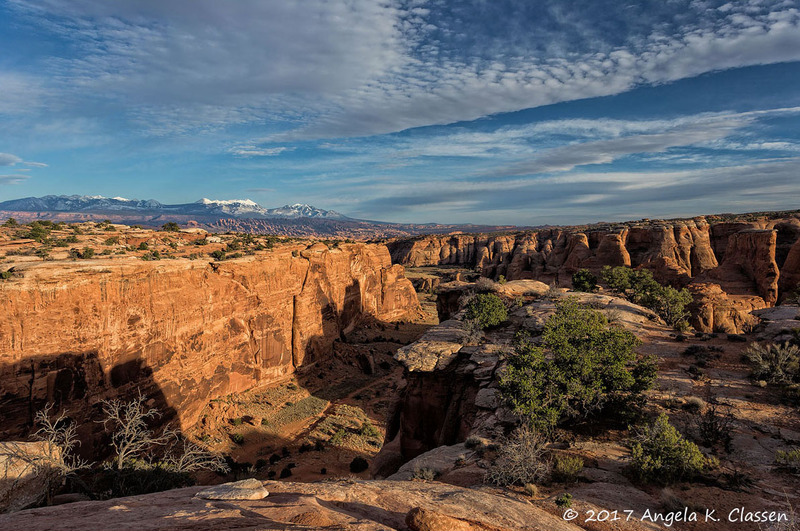 I love this spot because the view is filled with fins, arches and the La Sal Mountains. I took this shot in mid February right before the sun sank below the horizon. The rock always glows a magnificent shade of orange, and I had some decent clouds as well. While my husband was taking a mountain bike ride on Engineer Pass, I made it down to Silverton, just in time to catch both trains! This was the 11:30 as it sat, unloading passengers. The conductor got out of the cab and was doing his post-trip check. I thought that human element and the black smoke against the bright fall foliage in the background was pretty cool. 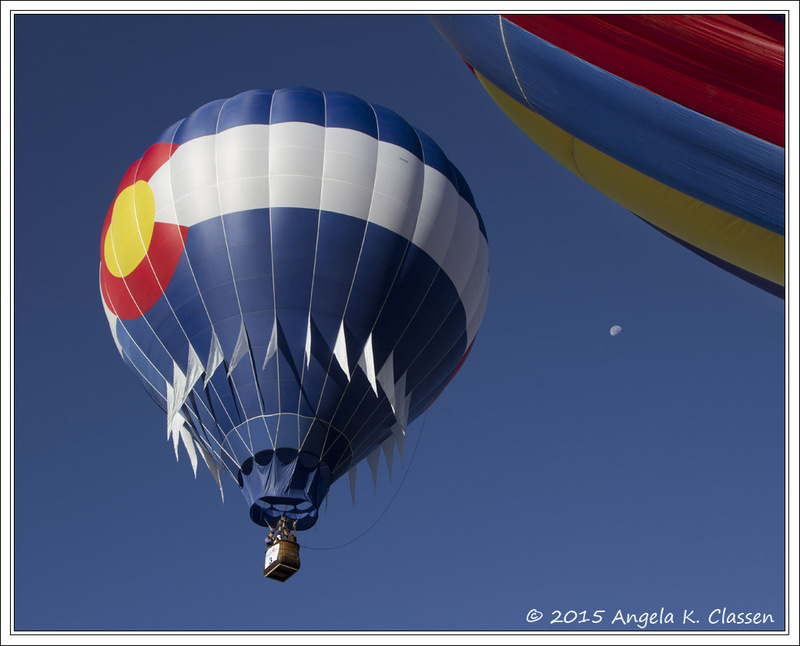 In July, I had a job interview in Moab – of all places! (I didn’t get the job…) After my interview, of course I had to make use of my time and take some photos. I hadn’t been down to Faux Falls (which is near Ken’s Lake south of town) in several years so decided to go check it out. There are so many composition possibilities of the waterfall and stream, and I spent probably 2 hours walking around and shooting. This was one of my favorite shots of that day, a more intimate shot of the lower part of the fall where it dumps into the stream. In February while snowshoeing around Sunset Lake on Grand Mesa, the day after a fresh snow, the wind would occasionally come up and blow snow off the trees. 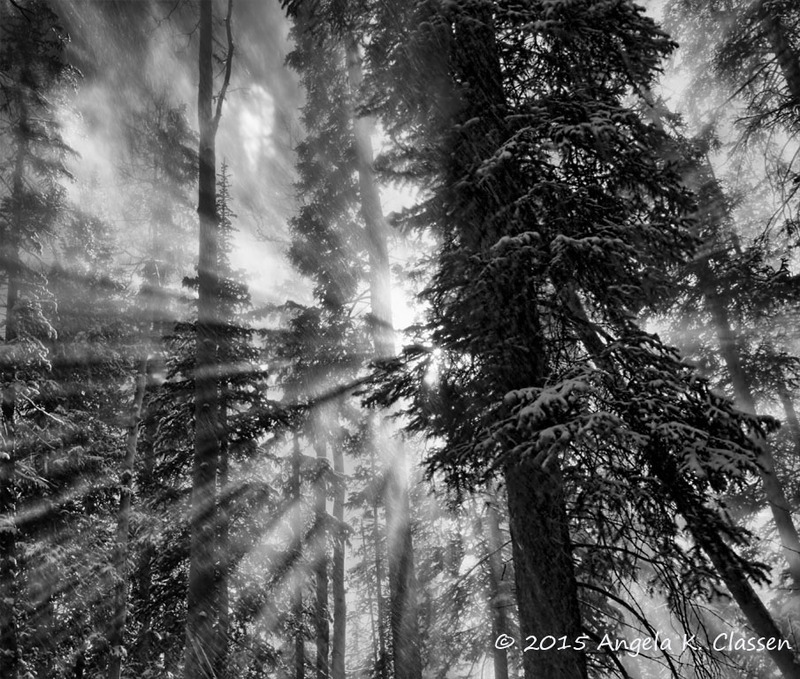 I was in the right place at the right time to capture this one – the blowing snow created beautiful sunbeams in the trees. Converting this one to black and white was a no brainer. Another shot from my “interview trip” in July. After I shot sunset near Balanced Rock, I happened to turn around and see that a storm was coming in from the southwest, and there was lightning! A lot of my camera club buddies go out shooting lightning but thus far I have been too chicken to try, except from the inside of the car. This storm was far enough away that I felt safe, so I gave it a whirl. I took probably a hundred images and only caught lightning in 3 frames, and this was the best one with multiple strokes! As I left the park and the storm got closer, the lightning really ramped up and I definitely did not feel safe to stop and shoot it. The storm followed me all the way home. It was an interesting end to the day, I must say. 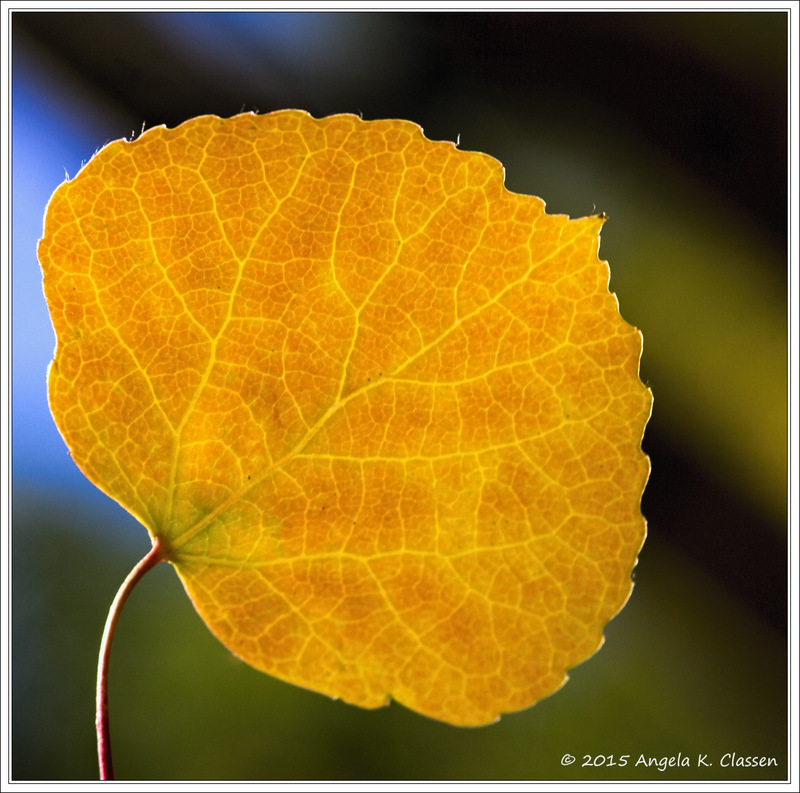 While driving around on the Grand Mesa, I found a great spot where I could backlight some aspen leaves. I broke out my macro lens for this shot. I like all the details of the veins in the leaf and the pleasing colors in the background. And at long last, here is #1! 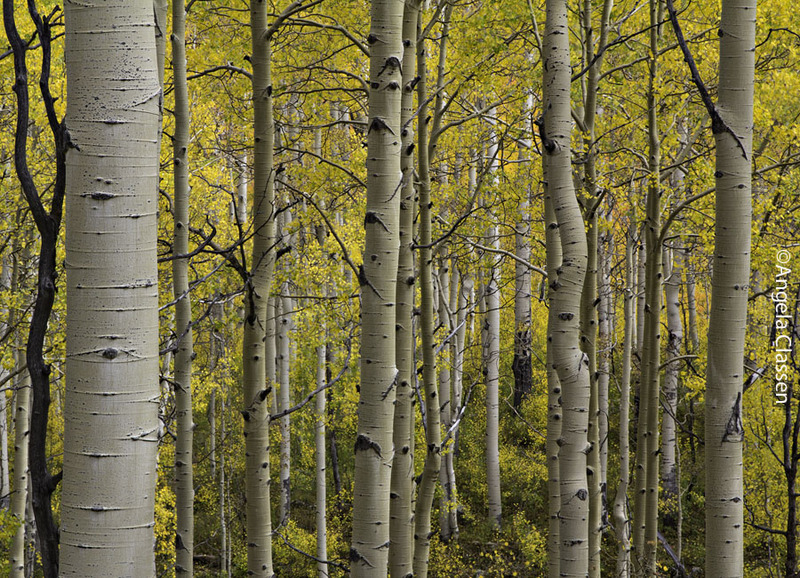 I drove up Kebler Pass in late September only to find many aspens had been hit with the fungus/blight. There were some nice pockets of color at the top, but the west side was very disappointing. I always hope to find some ferns up there that haven’t turned brown yet and thought I had found a spot and got out to check it out, only to discover they were browner than they appeared from the roadside. However, I took the time to look straight up – and found a shot I’ve been wanting for many years. I ran back to my car and put my wide angle lens on, found a log, and sat down to shoot this. The mid-day light happened to be just what was needed for this shot and I’m very pleased with how it turned out. It is my favorite shot of the year, hands down. My photographic year was fairly quiet as due to my dampened mood, I did not seek out places to exhibit this year. 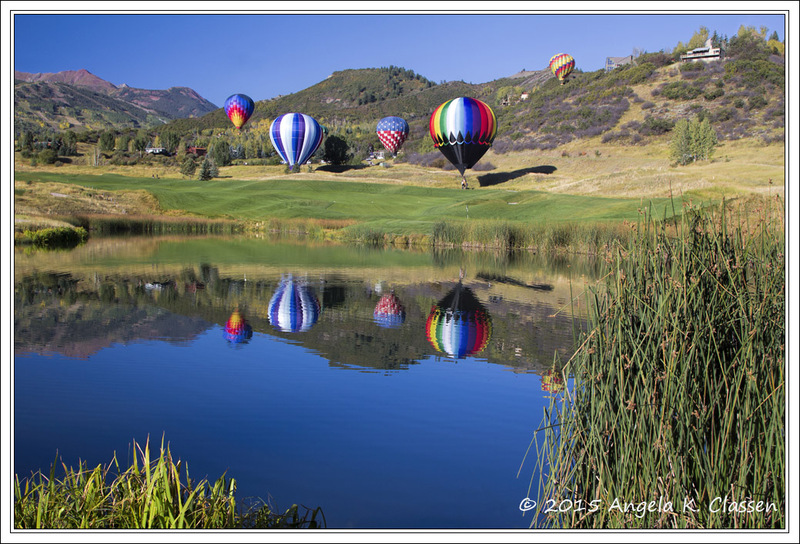 I did have three photos displayed at Tiara Rado Golf Course (in the clubhouse) as part of the City of Grand Junction’s “Hot Air Balloon” display there for three months, but that was about it as far as displays. 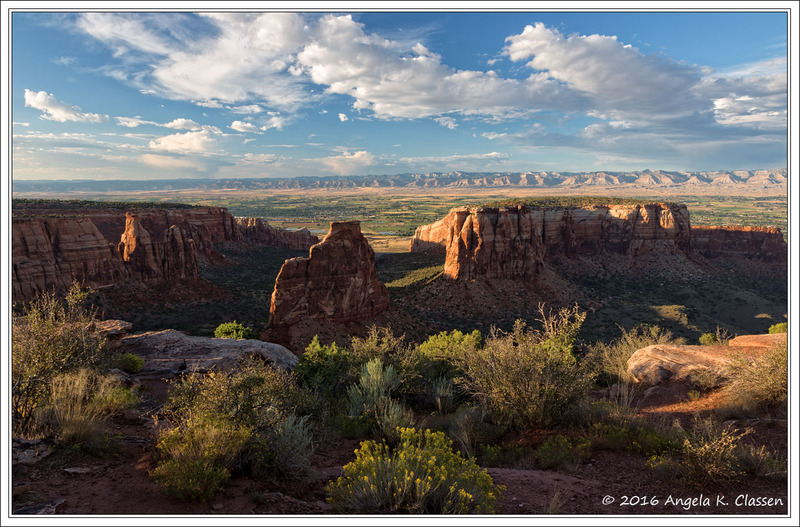 I did get one large photo (September) and one small photo (July) in the Colorado National Monument calendar which is always great. I had a photo published in the March/April issue of “Colorado Life”, and I got the cover image for the October issue of “Colorado Lawyer”, the official journal of the Colorado Bar Association. 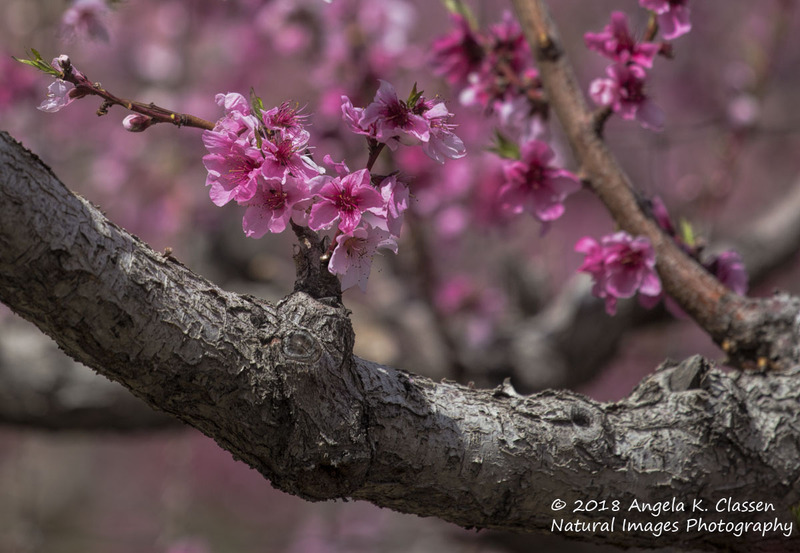 I was very quiet in my internet groups but did receive one Editor’s Weekly Pick over on Nature Photographers Network (in the Weekly Challenge category for “Seasonal Transitions”). With all my “free” time during my period of unemployment, I did manage to get my photo library keyworded, which was a huge undertaking. Now that it is done, however, I find it much easier and quicker to find photos, and I’m now automatically doing that upon import. I got my money’s worth out of KelbyOne by watching a number of videos (most of them were pretty basic) and decided to renew again for next year (hopefully I’ll get into more advanced applications such as masks and layers). I hope all of you had a great 2015, and I wish you great light and good luck in 2016! I see that I did NOT manage to obtain at least one goal from last year, that is: posting more here on my blog. It’s been almost a year since my last new post. I intend to do better this year! That said, it’s time for the annual year in review. This year was in sharp contrast to 2013. In 2013, I had a very hard time narrowing down my favorites because I had quite a year. For 2014, I had a very hard time finding 14 favorites. I seemed to miss the best weather, peak wildflower bloom and peak fall colors, plus I did not travel around nearly as much. Let’s begin the countdown. You will see a rather varying range of images this year, due to my experimenting with things other than landscapes and flowers. #14 – Play Ball! 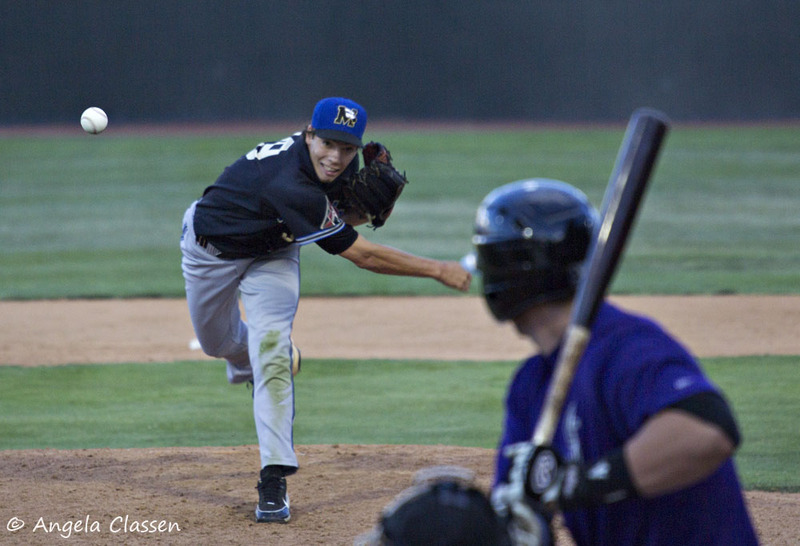 I went to quite a few baseball games this summer and enjoyed watching our local minor league club, the Grand Junction Rockies. One of my camera club buddies is also a big baseball fan and one evening she scored us tickets right behind home plate! It definitely tested my skills since I’m not a sports shooter and don’t have a big enough or fast enough lens to really catch the action. But, I had a lot of fun trying at the various games I attended. The night I was behind home plate, if I leaned in close enough I could make the net disappear but it was hit and miss. This was one that turned out. I was amazed that I caught the ball suspended, with the seams visible! This image earned me a weekly Editor’s Pick award on Nature Photographers Network in the POP (people, objects and places) category. 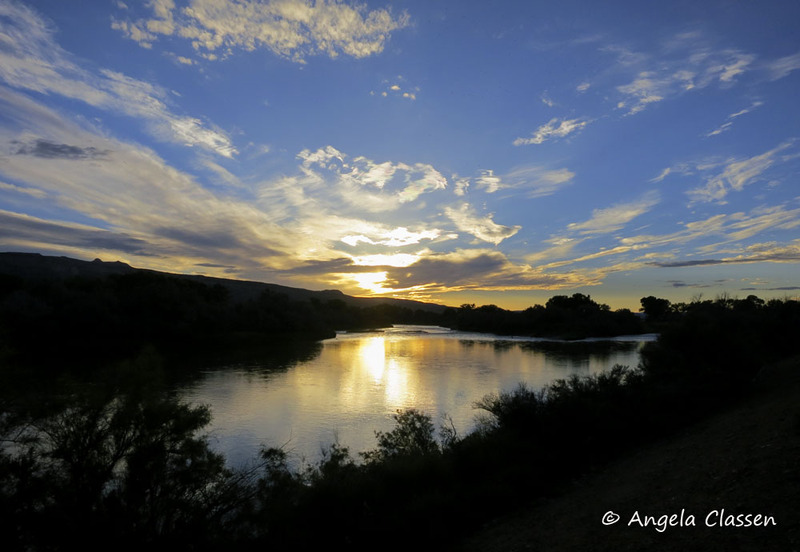 #13 – Colorado River Trail Sunset – The Colorado River Trail continues to expand, and late this fall the latest portion (an addition to the Monument View section) opened. I got a bike this spring so I was excited to have a new place to bike and gawk at the scenery. This section goes from the Walter Walker Wildlife Area all the way to Fruita. Although I haven’t made it all the way to Fruita yet, I plan to work up to it this summer. The second time I rode this section of the trail, I brought along my trusty little Canon S100 and shot this where the trail is nearly right on the river. This is a great spot and I hope to get back there more times this year to shoot some sunsets. 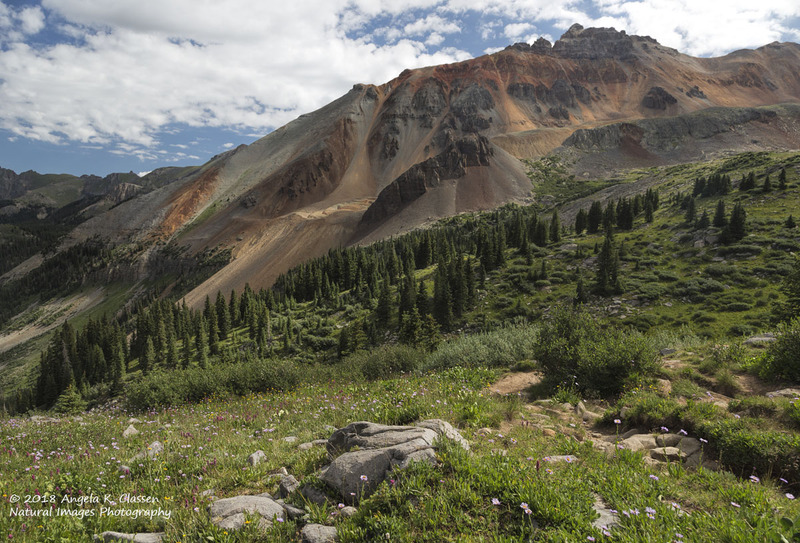 #11 – Professor Valley Cottonwoods – After the color in the high country had faded, I continued to chase colors in the lower valleys. 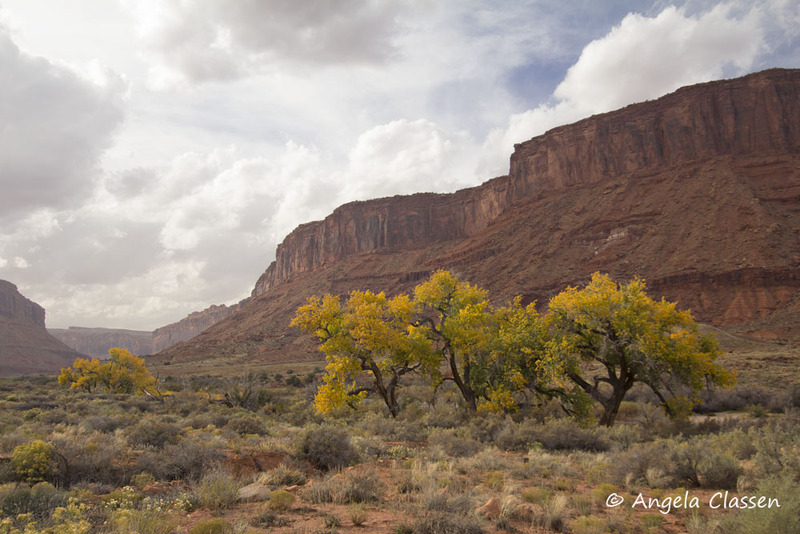 I went to Moab in search of color but unfortunately the extremely windy conditions had pretty much stripped the trees. I did manage to find this beautiful scene in the Professor Valley on the scenic river road on the way back. There was a storm front moving in but the sun peeked out long enough for me to catch this. 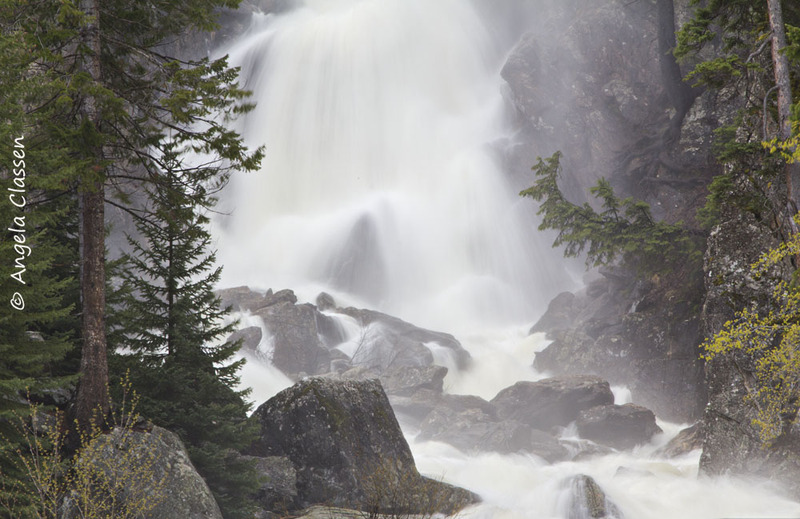 #10 – Mesa Cascades – I love to shoot waterfalls and cascades, so this cascade behind the Mesa Lakes Lodge captured my attention. I spent a lot of time finding different compositions and enjoying the gurgling of the water as it spilled down the hillside. I found the “S” shaped creek to be a pleasing component to the composition of this image. #9 – Summer Sun – On my way back home to Kansas, I stopped at the Denver Botanic Gardens and took in the Chihuly glass exhibit and wow! I must say, I’m so glad I did. It was absolutely amazing. The glass glowed and sparkled in the sun and totally intrigued me. 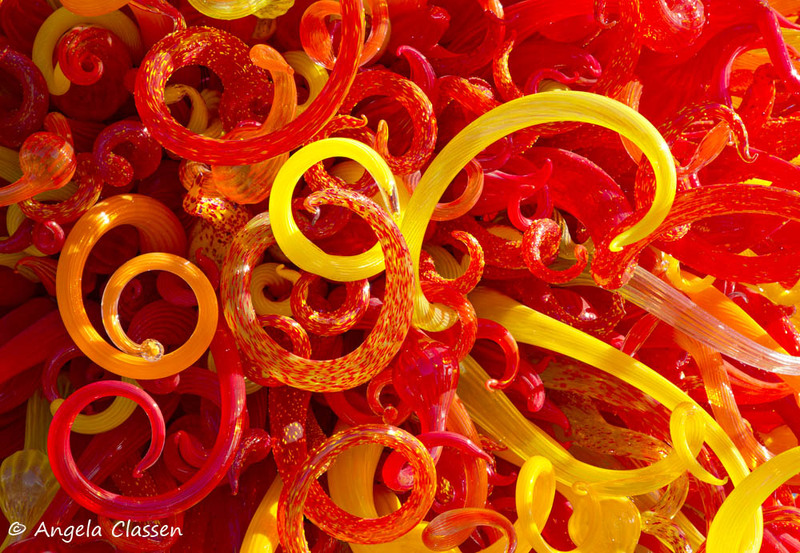 This is an abstract close-up of one large piece called “Summer Sun,” a tree-like structure. The shapes, textures and colors mesmerized me. 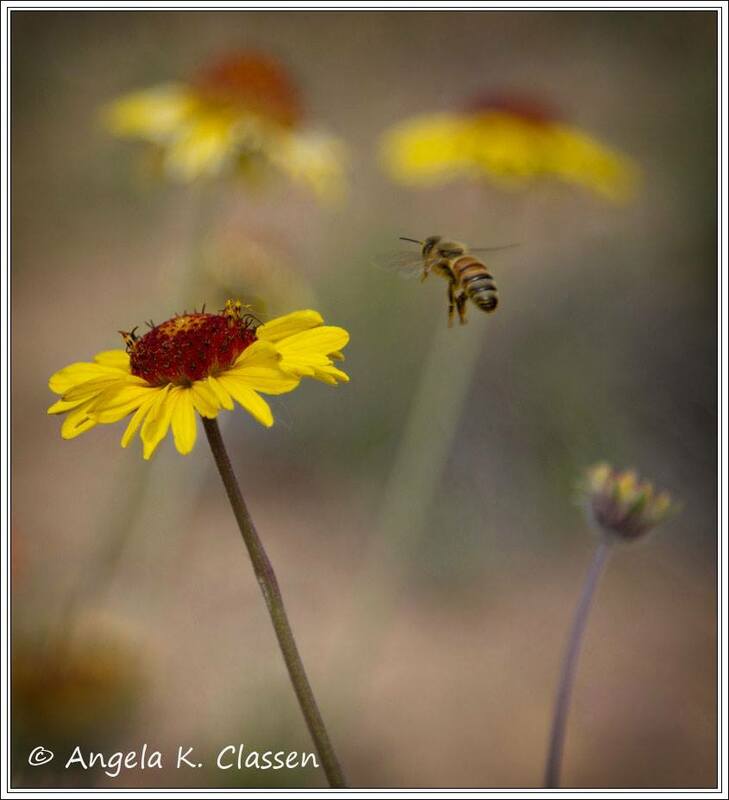 #8 – Incoming – This spring brought an incredible display of bloom out on South Camp Road (near the Colorado National Monument). One afternoon while I was shooting some of the lovely primrose, I found some blanket flowers and noticed bees buzzing around. I was lucky enough to capture this one as he came in for a landing for a sweet snack. 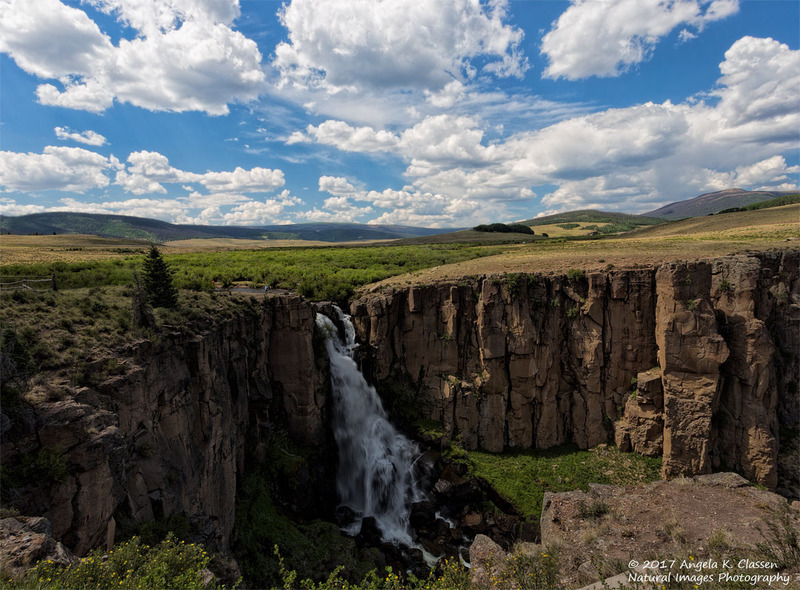 #7 – Fish Creek Falls – After the opening of my exhibit at the Steamboat Art Museum, I couldn’t resist making a quick stop at Fish Creek Falls for a little photo therapy. As I arrived, some storm clouds moved in, eliminating some harsh shadows and providing even light while I shot. This was shot from the safety of the footbridge across the creek. It was near peak runoff and I couldn’t believe the volume of water coming over the cliff, or the resulting roar! It was deafening. 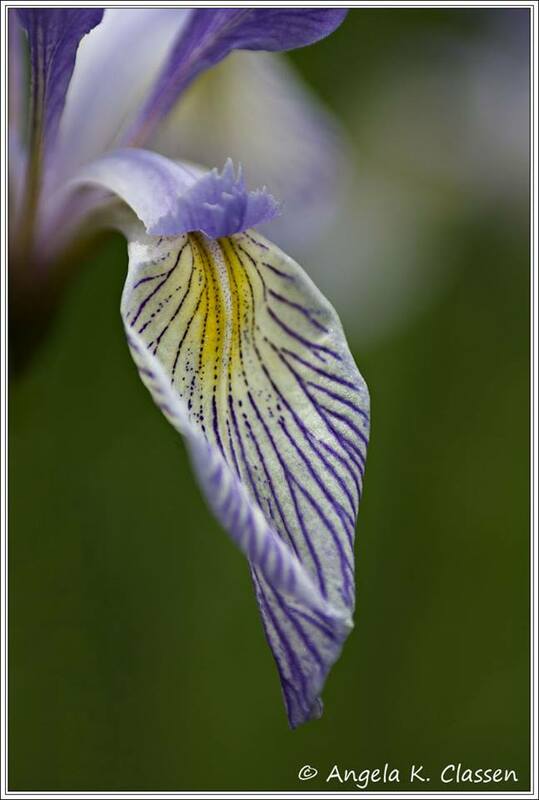 #6 – Rocky Mountain Iris – My husband and I camped in a little cabin on the Uncompaghre this summer, and while he and his buddy went mountain biking, I drove around and shot some photos. I found a really nice grouping of Rocky Mountain Iris near a campground. I loved the patterns of this iris petal and broke out my macro lens to get some nice close ups. 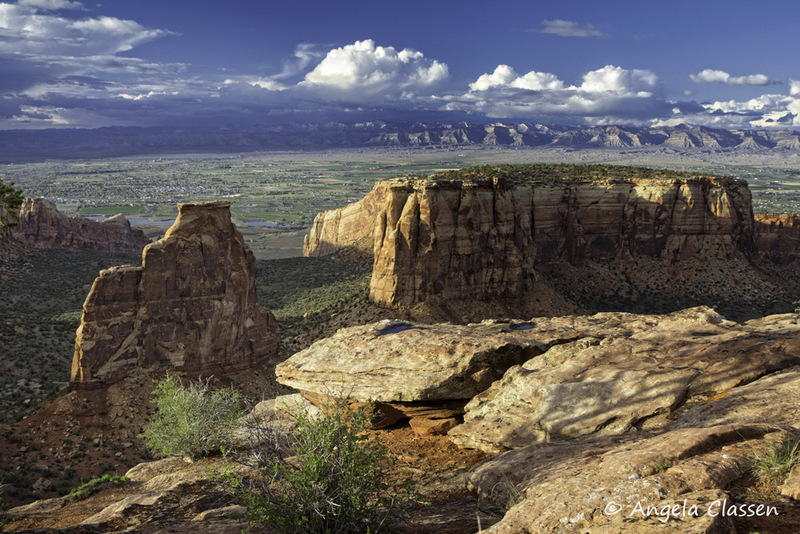 #5 – A Grand View – One of my favorite viewpoints in the Colorado National Monument is Grand View. It offers great views of not only Independence Monument but also the Kissing Couple. On this spring day, I headed up to the Monument hoping to catch some great clouds and storm light. It’s always incredible to watch storms move in over the Book Cliffs and into the valley from up on the Monument. 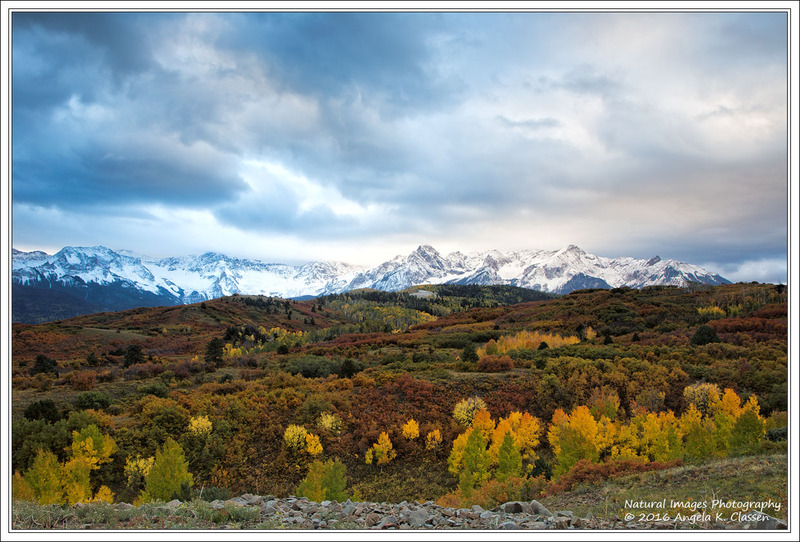 #4 – Mesa Aspens – I didn’t snowshoe a lot last winter; in fact, I didn’t even go until late February/early March. These two clusters of trees caught my eye because of the strong vertical lines as well as horizontal lines created by the shadows. 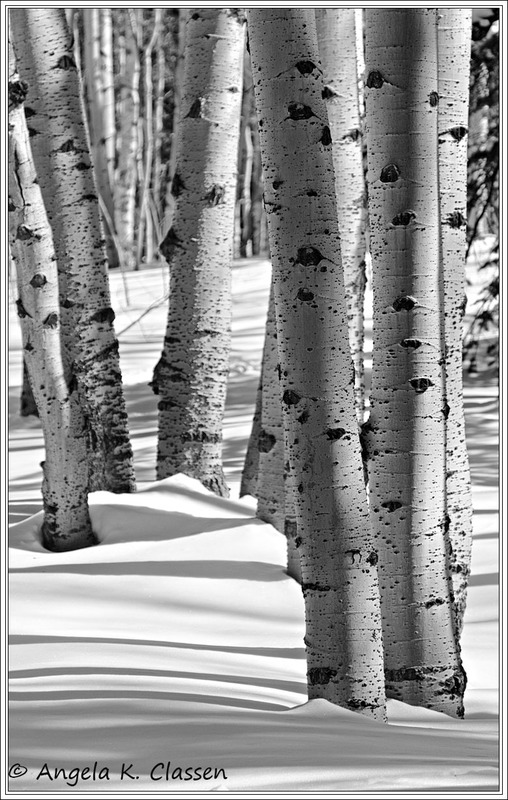 A conversion to black and white was a no brainer with this scene as there was little color anyway and aspens in snow just look cool in black and white, don’t you think? 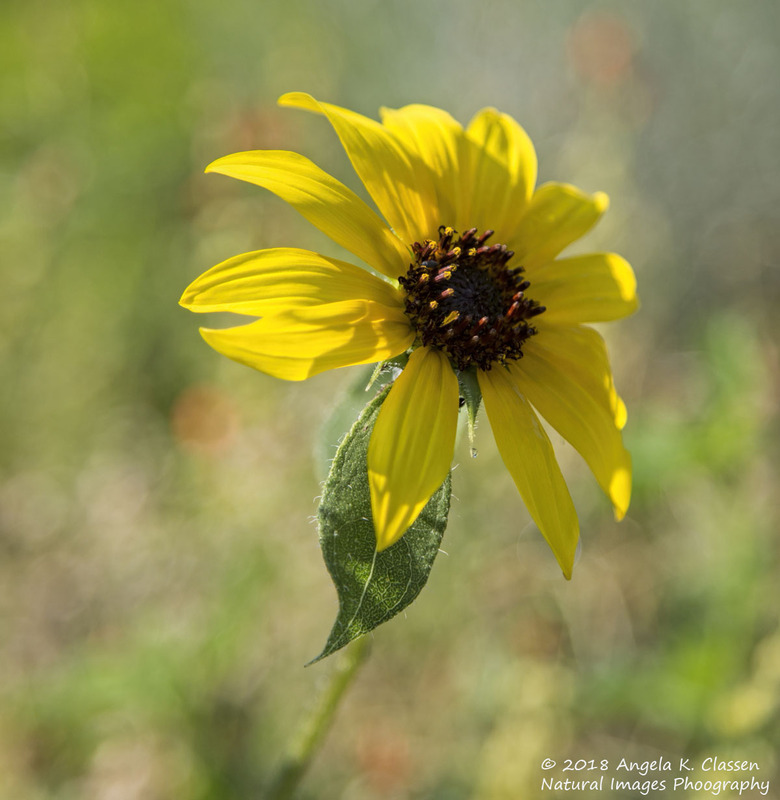 #3 – Mesa Garden – I found some great pockets of wildflowers on the Grand Mesa this summer, one of them right off the highway just north of Land’s End Road near a lake. This year, there was a brilliant display of rosy paintbrush, sneezeweed, lupine, and I even found some elephant heads. This combination of brilliant colors captured my eyes immediately. #2 – Red, White & Blue – I shot this on July 3, as I was headed toward the west side viewpoints to find a place to shoot the Fruita fireworks show from the Monument. Even though I knew I was losing out on any good parking spots, I couldn’t tear myself away from this brilliant pre-fireworks light show! This view into Wedding Canyon is my favorite spot in the whole park and I often just sit here, gazing in wonder at the views. And now, for No. 1! 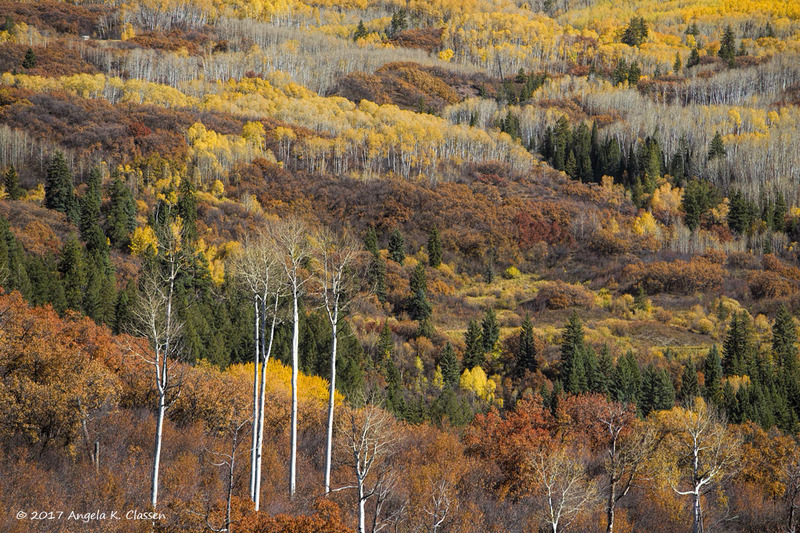 #1 – Mesa Aspens – I did have one great day shooting fall foliage, up on the Grand Mesa, which put on the most fantastic display I have seen since I moved here. The day I went up, there was a storm front coming in, which pretty much killed all the color over the next few days so I’m glad I got out. I did a bit of exploring on the southern side of the Mesa and came across the Old Grand Mesa Rd., which had some of the most beautiful groves I have seen, including brilliant orange aspens. As the clouds spilled in, it provided even lighting in this grove. So there are my favorite images of 2014 – perhaps not the most technically or compositionally correct, but ones that touched something within me personally. Now for my highlights from last year and goals for this coming year. 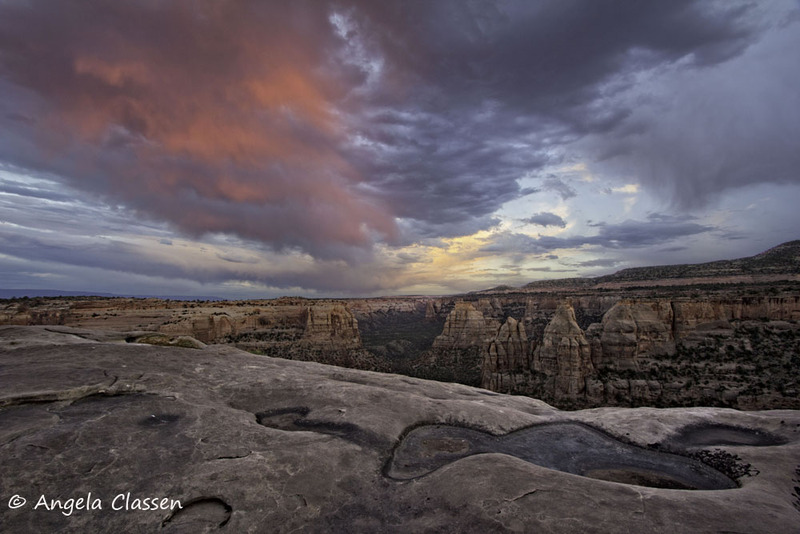 2014 began with a solo show at Aspen Photo Art Gallery here in Grand Junction, as well as a piece being on display at the Monumental Art Exhibit at City Hall. I attended the majority of First Friday Art Walks with a couple of pieces on display each time at Aspen Photo Art Gallery. In June, I had five pieces on display at the Colorado Nature Photography Invitational Exhibit at the Steamboat Art Museum. This exhibit contained images from ten other amazing Colorado based photographers – Todd Caudle, Rod Hanna, Joshua Harding, Jason Hatfield, Jack Brauer, Scott Fricke, Monte Trumbull, Anne Rusk, Rich Voninski and Jim Steinberg. I can’t tell you how overwhelmed I was to be included with these amazing artists! I also exhibited some images with Thunder Mountain Camera Club at City Hall later this summer and at the United Way office. 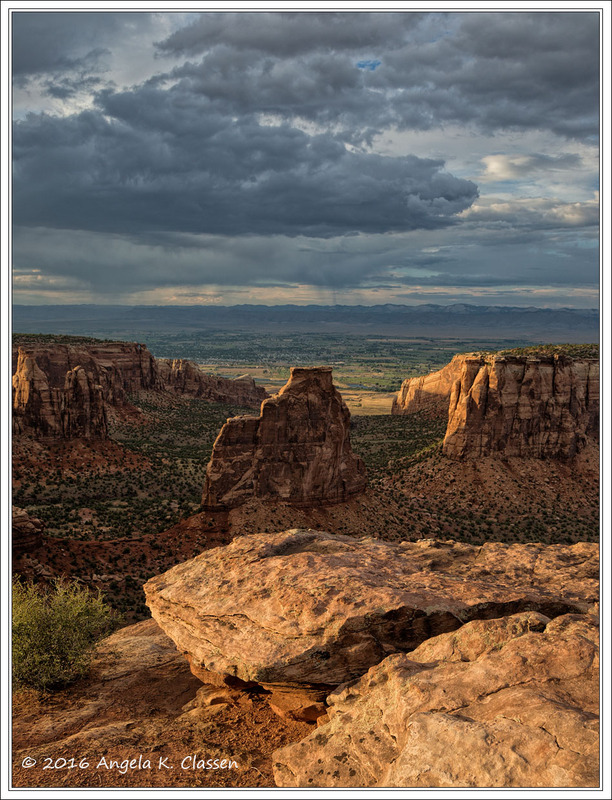 One of my images made it into the GJ Daily Sentinel’s annual “Behind the Lens” issue; I have 4 small images included in the 2015 Colorado National Monument Association calendar; and Brown Trout has licensed one of my Kansas images for the 2015 “Wild & Scenic Kansas” calendar. As I noted in the photos above, I received three weekly Editor’s Pick awards from Nature Photographer’s Network, and I was thrilled to learn my “Dead Horse Rainbow” image (taken in 2013) was picked as one of 25 finalists in Outdoor Photographer’s American Landscape photo contest. I had a very busy year! I also feel I broadened my horizons a bit by trying my hand at shooting something other than flowers and landscapes. 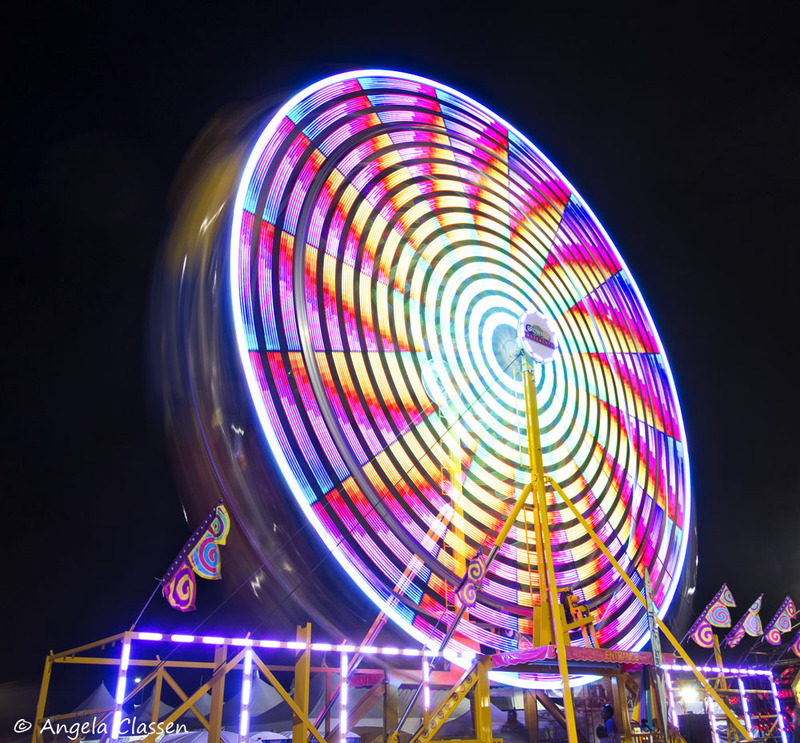 I went to the Fruita Rodeo one night and enjoyed trying to shoot the fast action of the cowboys, bucking broncs and barrel racers, as well as shooting numerous baseball games, three fireworks shows, carnival rides at the fair, and Christmas lights. My goals for this year are pretty much the same as last year. I need to re-organize and keyword images after my devastating hard drive crash. (Thank goodness I had recently backed up my photo data.) I plan to set aside more time to learn post-processing techniques and have signed up for a KelbyOne account. KelbyOne has tons of instructional videos on Photoshop, Lightroom, etc. When I feel more comfortable with Photoshop, I’ll then dig into the Tony Kuyper series of videos and Photoshop actions on luminosity masks. Really looking forward to that! I hope I can snowshoe more this winter and hike more this spring, summer and fall. I want to travel more, and time my visits right this year so I catch peak wildflower blooms and fall foliage. Thank you to everyone who follows my work and for your continued support. I’ll try to be more active here on my blog this year and share some of the things I’m going to learn along the way! I wish you all great light and stellar images for your 2015! 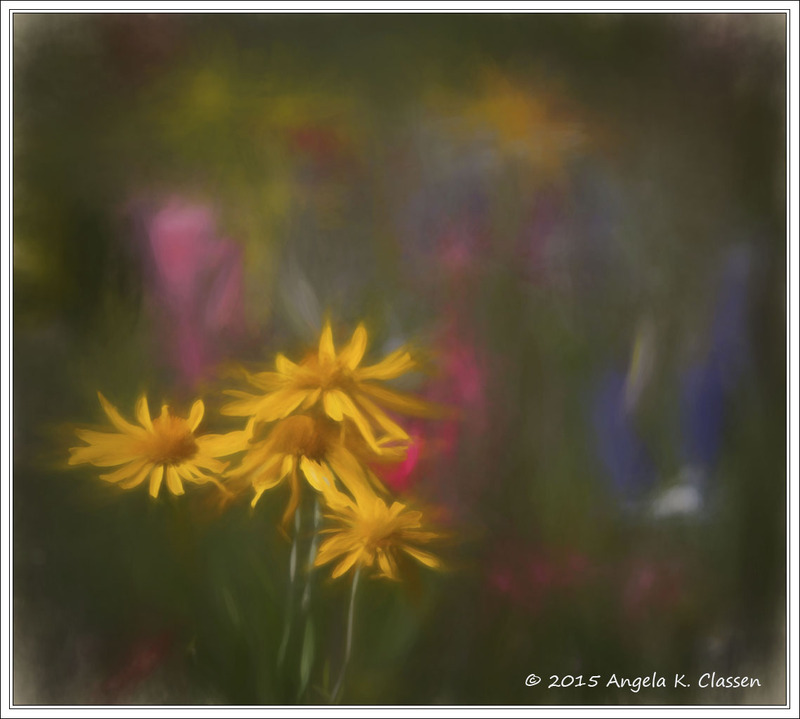 ALL PHOTOS AND TEXT ON THIS SITE ARE COPYRIGHT ANGELA K. CLASSEN AND MAY NOT BE USED WITHOUT PERMISSION. I started this blog to share my passion for photography (and the sometimes funny stories that happen along the way) with others. I also want to dispel the myths about Kansas being flat and uninteresting through my series of "On Location" posts. Now that I've moved to colorful Colorado, follow my adventures as I explore my new home.